This can no longer be a coincidence: Dukes Barn time and the weather was nigh on perfect, once again. All the children turned up in good time and, with no obvious alarms, we set off. Familiar faces welcomed us and we had our obligatory tour of the site. Cases were unceremoniously dumped in dorms and we gathered in the extended dining room for a much-needed feed. Once suitably dressed, we joined our respective group leaders and ventured off to pastures far and wide. The Rabbits drew the short (for some people long) straw of Miller’s Dale to tackle the seemingly world-renowned 40ft abseil. Mr Willis was greatly impressed with Cerys, who willingly volunteered to be the first of the year group to go. Eva’s initial thought was to avoid the whole thing, but her perseverance skills kicked in and she went for it. All the while, Divine’s enthusiasm for everything helped to perk some of the others up, too. Mr Dudgeon, Ms Stephenson and the Owls accompanied Dan to Devonshire cave, high above Matlock Bath. Shreyank impressed with his willingness to carry the heavy bag up the steep incline, whilst Lydia’s positivity impacted favourably on the group as a whole. At lower moments, Jack’s support and encouragement lifted morale when it was most needed. Mrs Sellars, Miss Farnsworth and Colin, not forgetting Daisy, Colin’s new four-legged friend, drove up the hill and found their way back via a plethora of obstacles. Amongst those who impressed, Alexia fully embraced the outdoors, giving her wellies a thorough workout. Milo and Rowan managed to find some unique routes through which to plough, fortunately in Dukes Barn gear rather than their own. Mr Simmonds and the Foxes headed up Hell’s Bank to find the minibus left by the Badgers. Woody managed to rescue some boots from potential ignominy, whilst Sophie led the group across some treacherous terrain. When we had to find the minibus keys as our final task, William F saved the day when it appeared we may have to camp out on the tops for the night. Our first dinner consisted of pizza and chips (with salad for a few…), followed by chocolate sponge and custard. We then wrapped up for the night walk; once the children had become ‘Friends of the Dark’, we returned without the need for our torches. Bedtime. Much needed, but a successful first day. Grey skies and a slight nip in the air awaited us this morning, but the forecast was positive and spirits were high as we took advantage of one of the Barn’s true highlights: breakfast. Mr Willis and the Rabbits began on site, with Katie’s prowess on the climbing wall a particular standout. They then moved on to the ropes and tunnels, in which Martha T managed to rescue a few others with her calm, supportive nature. After lunch, they went off for a walk; Alyshia found the bank climb a real challenge, but impressed with her perseverance, whilst Sam H and Felix took on the navigating role, despite the terrain and route being particularly testing. 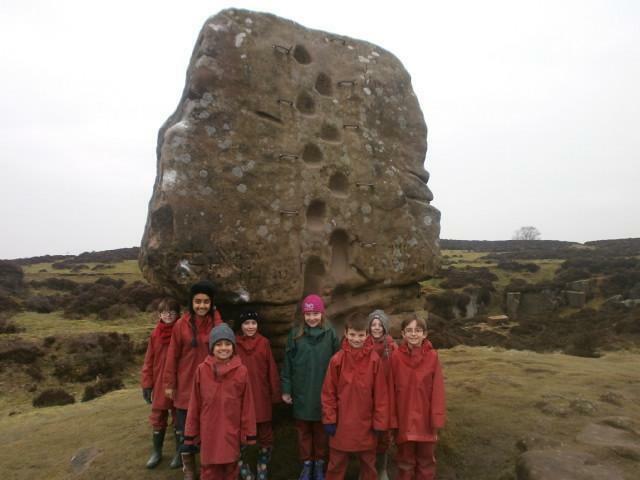 The Owls headed to Stanton Moor for a walk with a twist; the story of the nine ladies kept us thoroughly entertained. 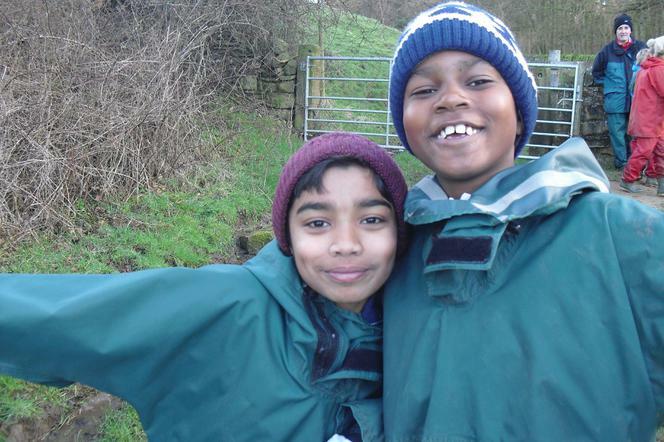 Eddie’s enthusiasm and knowledge made the trickier parts of the walk just as much fun, whilst Raihan bounded around the route with infectious energy. After lunch, we stayed at the Barn. Austin’s skill on the climbing wall impressed, whilst Flo and Martha were terrific on the problem-solving tasks and ropes. The Badgers began at ‘The Bridge’. Rose’s enthusiasm was unrelenting, whilst Archie helped with the harnesses, ensuring that the group got plenty of time to abseil. We then went to Mouldridge, where Daniel looked after the staff who were more fearful than himself. 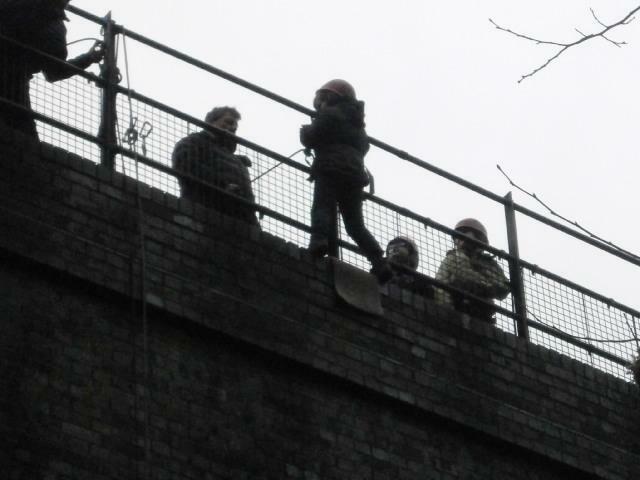 Ebony followed on from her increasing confidence abseiling with conquering her fear of heights. The Foxes went to Mouldridge in the morning, actually relishing the mine for being warmer than the path outside! George shared his knowledge of geology eloquently, before Joseph squeezed through the tightest gap despite his reluctance. When abseiling, Harry C was great after an initial wobble, whilst Isla and William L impressed guest Staff member Mr Arnold with their maturity. Sausage and mash, followed by apple crumble and custard, ensured that everyone was suitable sustained. The evening then saw the usual merry-go-round of packing, shopping and performing for dorm inspections. A World Exclusive now: the Meeting Room group won with a score of 9.5. Divine and Eva were the victors in our legendary Bingo Night. We are all now absolutely in need of sleep. A light frost to start the day, but the promise of glorious late-winter sunshine added to our joy at the thought of another morning of adventure. The rooms were emptied in record time; indeed, us regulars cannot recall a more seamless final morning for a group. Breakfast was as wonderful as ever and we put on fewer layers than we’re used to. The Foxes remained on site, with the Ropes Course first up. The sun shone brilliantly as Verity calmly suggested ways of solving problems as a team. Matthew endured some comedy moments, but smiled all the way round. 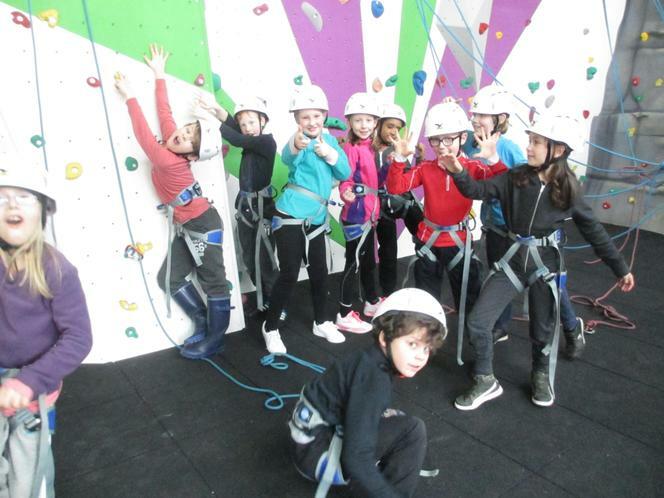 On the climbing wall, the whole group were adept at the range of skills needed, but Jemima’s keenness to learn was a real example. 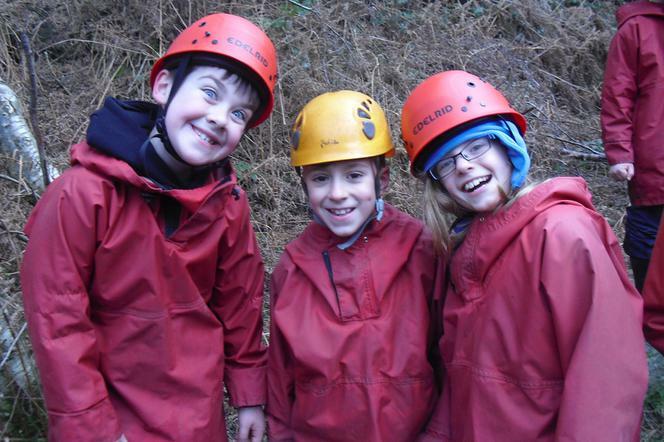 The Owls abseiled; Oliver’s determination and leadership helped things go smoothly, whilst Jude’s effort and positive attitude led to plenty of successful descents. Jacob and Holly were have-a-go heroes all morning, reflective of their whole experience. The Rabbits went caving and Sammy B was the first to try some of the more tricky routes. Owen and Henry answered some of the more scientific queries with great confidence. Badgers stayed closer to home. Amelia and Danny zoomed across the zip wire with relative elegance, before Heidi and Finley entertained with their irreverent approach to negotiating the ropes course. By the time we returned to base, Group 2 had arrived. Amidst the mild chaos, we managed to send our heartfelt gratitude to the staff. Mrs Sellars, Mr Willis and Miss Farnsworth are leaving us. They’ve been fabulous and we thank them for their time and enthusiasm. The afternoon began with the new Badgers, accompanied by Mrs Myring and Miss Rimington, ventured upon a lovely walk to Chatsworth, under clear blue skies. Steph threw herself into everything, entertaining the group with her positivity and energy; Arthur’s caring nature came to the fore as he helped others at difficult points; Ty persevered when his energy levels were sapping and his smile remained throughout. 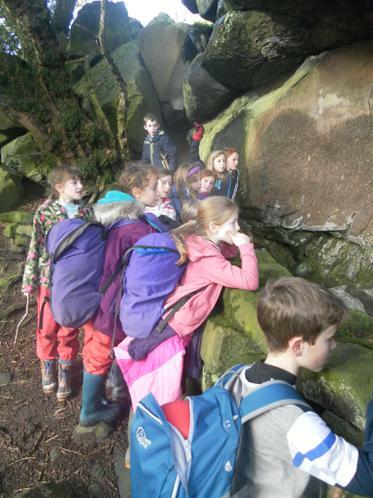 The Owls went to Devonshire Cave, where Edith’s knowledge of the rocks kept the entire group informed. Clem’s confidence manifested itself in a supporting of his group members and Aaira decided that attack was the best form of defence when facing her fear of the dark. Rabbits and Mr Simmonds were taken round the houses on an adventure walk with Aiden. Oscar was a real trooper, loving the nature and surroundings, whilst Kole displayed a real maturity in his castigation of some visitors to the area who had littered the place. Ari took the minibus trick with good grace, once we’d informed him that the keys had been snuck into his pocket! Mr Cunningham took the Foxes to the Bridge. Harry was not keen, but by his seventh time, had fallen in love with the whole thing. Charlie W volunteered to go first and inspired others, whilst Isabel L really had to grit her teeth before swinging down like a pro. It was sticky toffee pudding night, so, for some, the main course of burger and chips was a means to an end. It was delicious, though. We then headed up the hill under cloudless skies for the Night Walk. This weather is ridiculous; the mist soon rose and, by the time we were out on activities the sun had burnt it all away. Spring has certainly sprung up here, though probably just for us. 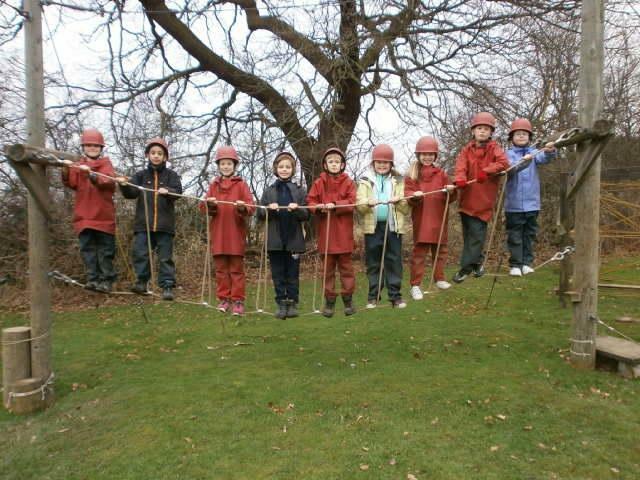 Badgers only had to trek over the driveway to the Ropes and problem-solving. Safiya proved to be an excellent leader, taking charge on the See-Saw. 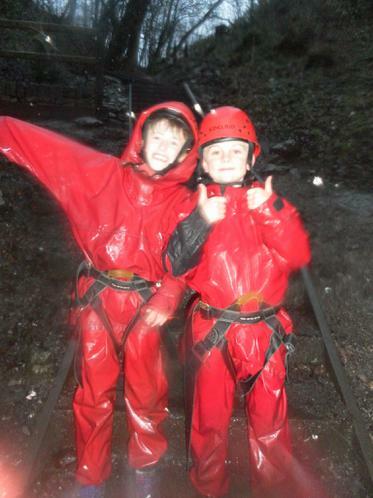 Josh and Brendan were speedy on the ropes and through the tunnels. Ruby and Sammy then scored full marks on the zip wire and adept on the climbing wall. After lunch, we took on the cave, in which Hannah displayed true calm in leading the group through all manner of gaps. The Rabbits went to the bridge and beat other parties to the prime spot. The whole group zoomed down with real zest. 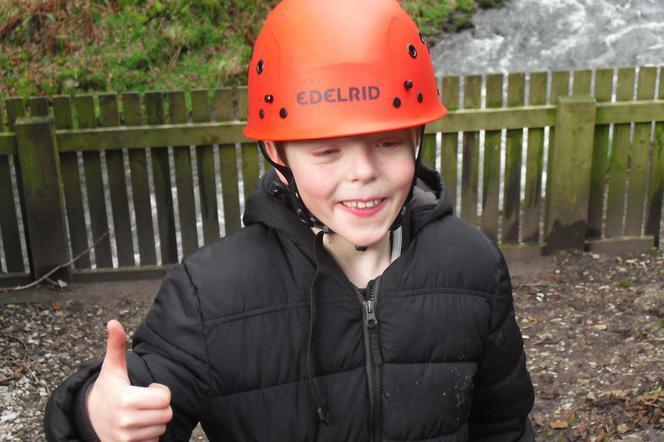 William C-E managed to abseil and wake up all surrounding areas in one go! Jack was the definition of laid back as he swung down four times, whilst Haya’s mood changed rapidly once her feet touched the ground. Devonshire Cave ‘welcomed’ us in the afternoon. Monty was at once brave and knowledgeable, discussing the geology and compensating for Mr Simmonds’ broken torch. Vishnuka and Isabel weren’t keen to start with, but this soon changed when the games began. Foxes started by walking from the door and into the forest. Jasper and Milaan made the most of the mud and water, then not complaining when they began to tire. 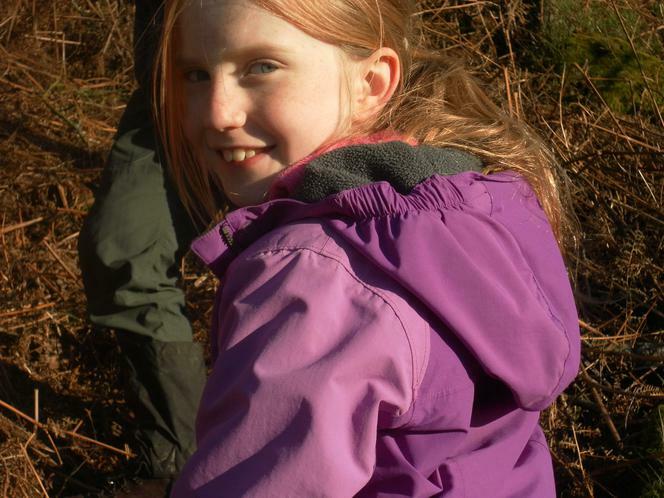 Marina explored the flora and fauna with curiosity and confidence in equal measure. On the climbing wall, Asha made short work of the tasks, whilst Thomas and Freddie got to the top with a mixture of determination and agility. 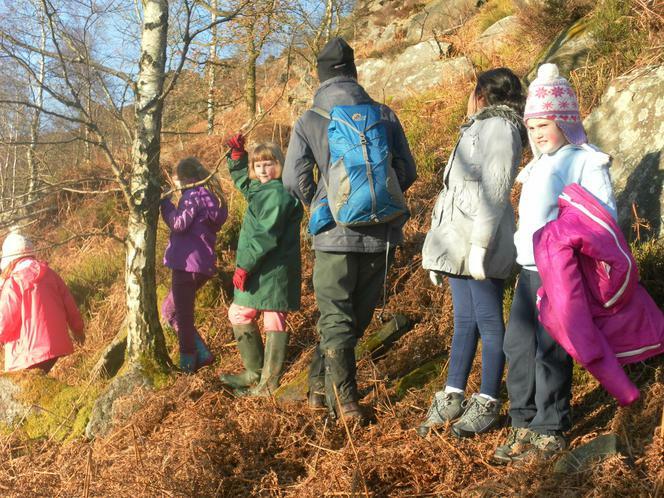 The Owls went on a walk at Padley Gorge. After he’d inadvertently fallen in the river, Will H was a fabulous leader and Annabel really got stuck in to all the associated games and tasks. At the bridge in the afternoon, Evan admitted to nerves, but to counter this, volunteered to go first and this worked wonders. Florence had a false start, but again, her approach was one of ‘Go for it!’ Ben was as enthusiastic and mature as he has been all week, displaying politeness and support to all others. Spag Bol and garlic bread, followed by profiteroles filled us all up, before the routine final evening of dorm inspections, shop and Bingo were a fitting end to a fine day. Just when we thought it couldn’t get any better, a peek out of the window first thing revealed the most glorious day February in this country could possibly provide. Our packing was done with few alarms and, for the last time, a DB breakfast was enjoyed. The Rabbits began on the climbing wall, on which Max looked so assured that he probably could have done it merely walking. Eleanor was first to reach the top and managed to pause long enough to smile for the camera. This lovely group worked as one on the Ropes Course, reflective of how much they’ve gelled over the two days. Foxes finished the week at Mouldridge. Alex shared his understanding of the features, whilst Emma and Noah took the whole experience in their stride, leading the group confidently. The Owls were terrific on the Ropes, with Annabelle and Isabelle particularly adept at instructing the group through the challenges. On the climbing wall, William H led by example, taking care but still pacey up the wall. 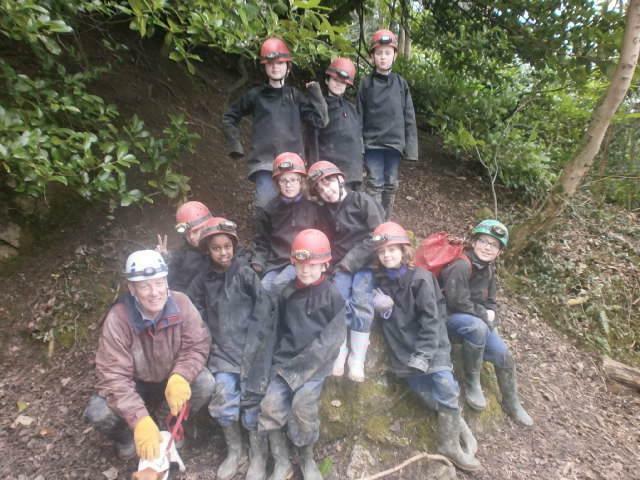 The Badgers were the final group to tackle the abseiling. The glorious weather added to the scene as Lawrence and Sai bemoaned the fence through which we have to climb, but loved the experience, whilst Ted’s nerves took the form of ‘the quicker I go, the sooner it’ll be over’, only to then run up the steps to have another go. We’re now eating lunch before preparing for the journey home. It’s been wonderful as ever, helped in no small way by the weather. As always, we are hugely indebted to the fabulous staff here. We cannot thank them enough for their welcome and organisation; we feel like old friends. Already, we are excited about next year and it can’t come soon enough. More often than not, we are blessed with good weather on these trips; we can’t recall a day better than this on which to begin our adventure. Clear blue skies and a slight nip in the air greeted us this morning, as we wheeled our luggage into the classroom. Logistics were covered and we sat down to a film, straining to control our excitement. Once lunch had come and gone, we leapt onto the bus and off we set. We were greeted by our two groupies for the week, Josh and Gav, who showed us to our dorms. The sun was still shining as we were shown around the site, before a few games on the field allowed us to use up some pent-up energy. Dinner time finally arrived, with sausage casserole or fish on offer, before we ended our first day with some Wacky Races in the Sports Hall; a blessing, as the temperature had dropped markedly. A good feed stirred those who hadn’t quite acclimatised to the new day, and we finally headed to the Activity Garden. Group 1, with Mrs Brown, began with All Aboard, a strange concept in which the idea is to all reach the fourth, and top, platform in unison; what tends to happen is children stepping on each other’s heads and, not the teamwork it calls for! Sam C-H displayed real expertise in his serene progress to the summit. On the Sensory Trail, the group would’ve been lost without Aniyah’s clear and concise leadership. The trapeze, a thin, tall tower with tiny foot rungs, topped with a platform the size of a water biscuit, awaited after lunch. High winds added to Sam W, Sophie Wynn and Raul’s trepidation, but, through tears and screams, they managed to all beat it: a wonderful effort and appreciated by their group mates. Orienteering was a suitable calmer to finish the day. Mrs Cox’s Group 2 also began with All Aboard, performing well against the clock, before the Sensory Trail tested a number of skills. Beatrix could claim to have passed such tests as much as anyone, with her calm, clear instructions from the front negating potential for heads banging into trees. After lunch, they took on the might of the Trapeze. After an understandably reluctant start, Liam, Ji Ji and Sean surprised themselves by reaching the top, whilst Kitty’s initial tears gave way to big smiles by the end. Group 3, accompanied by Mr Summersby, started their itinerary with the Sensory Trail, during which Phoebe’s communication skills came to the fore. All Aboard followed, where Josh requested a second go after a wobble on his first, literally as well as figuratively – exactly the sort of scenario PGL trips are made for. Orienteering featured in the afternoon, before the day drew to a close with the restful, relaxed Trapeze challenge…Niamh impressed hugely with her determination in trying circumstances, whilst Rais proved to be a huge asset to the group, such was his calm, reassuring support to those finding the whole thing rather daunting. Group 4 and Mr Simmonds replicated Group 3, with the Sensory Trail first up. Blindfolded and faced with numerous obstacles in the woods, Chloe stood out with her communicating skills. All Aboard followed, with Mathilda using every muscle to get as high as she could, despite the difficulties of minimal surface area and the clock ticking. After lunch, we joined forces with Group 3 to find various points around the site in the Orienteering task, before the trapeze welcomed us in its own, imitable way. The group headed towards a 100% record, with only two left to go. 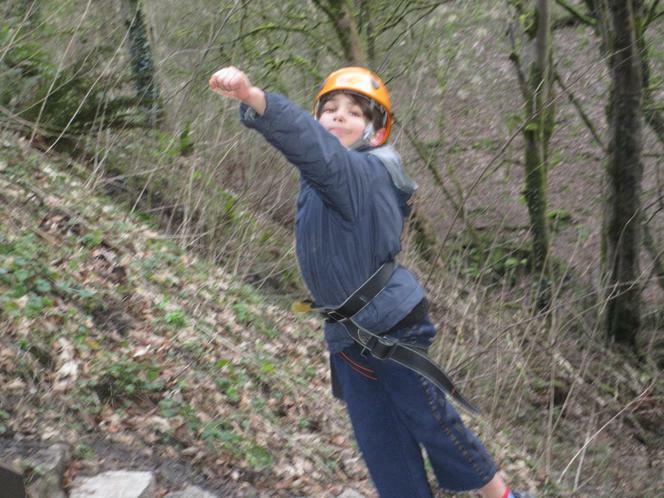 Jacob’s journey, a real rollercoaster of emotions, wrote itself into PGL folklore as one of the true ‘epics’. His final leap was a cause for great joy amongst the group and proved inspirational to Ben, who wasn’t thrilled at the prospect earlier. However, he too conquered the feat and all was well with the world. Mrs Parnell and her Group 5 began with Trapeze, not a gentle start to the week. Max not only scaled the heights, but flossed on his way down, whilst Shelby, against her better judgement, took on and defeated the beast, improving at belaying at the same time! Alfie L inadvertently found himself the centre of attention on the Sensory Trail, due to his unusual technique, which could be described as ‘bumbling’. He took the numerous practical jokes at his expense with his usual good humour. Dylan was the Marco Polo of the group, leading his team around the site with an array of clear instructions, before the climbing wall was encountered for the first time to complete a challenging, yet hugely successful day. Group 6 and Mr Martin also took on the trapeze. Lola could only be described as terrified and was close to giving up halfway, but with encouragement and determination, made it all the way to the top. Arian completed the task as he did all others, quietly and without fuss, whilst being a quite brilliant team player. The Sensory Trail provided a number of humorous moments before lunch. The experience of the trapeze stood the group in good stead for All Aboard, where Amelie drew on her earlier difficulties to enable her to scamper to the top with no problem at all. Orienteering was the final activity and gave Alfie N a rest from being a textbook harness remover, such an asset here and one that ensured that the group had plenty of time to have a real go at everything. Miss Woodforde spent her first full day here with Group 7. First up was the trapeze, from which Theo’s acrobatic leap impressed children and adults alike. Missy was a real detective during orienteering, her map-reading ensuring that her small group got back in time for lunch. All Aboard was a challenging start to the afternoon, but Emily’s unbounded enthusiasm helped hugely, as it did all day. Charlie G was the main man when it came to communicating the path around the Sensory Trail. Chicken Pie, meatballs or veg kievs were the food options, and the lemon drizzle cake had to be seen and tasted to be believed (we’ll let you decide whether that’s in a good way or not). The Quiz was our evening entertainment. In theory, this should’ve been ideal as a calming, more peaceful exercise. Far from it! However, the fight was clean and Group 4 emerged victorious. A fabulous day, with so many achievements big and small. We say goodbye to Mrs Cox and Miss Woodforde – thank you both for being great. It’s Hello to Mrs Moss and Mrs Minta. The wind had died down as we arose this morning and the promise of another lovely, autumnal day added to the spring in our steps. Breakfast was plentiful and we met at the activity garden with renewed vigour. The Climbing Wall represented Group 1’s first challenge of the day and the bell at the top was rung many times. On the Zip Wire, the noises emanating from Dan suggested he found the whole trip exhilarating; he also proved adept at assisting others with tricky harnesses. Once wraps had been devoured at lunch, Iris, Juliet and GiGi all worked wonderfully together on Jacob’s Ladder, ensuring that the apparatus caused no greater anguish than necessary. The whole group then worked well together during the Problem Solving tasks. Mrs Minta was Group 2’s new adult and she was hugely impressed Alex R on the Climbing Wall, as he reached the bell at the top in record time. Jacob’s Ladder, a 25-ft swing with logs at various distances apart, held no fears for Mia, who managed to reach the top rung, no mean feat. Alfie T displayed the benefits of teamwork, helping others before moving on himself. The Zip Wire and Problem Solving completed a terrific day. Hussain joined Group 3 for the day and approached everything with confidence, no more so than on Jacob’s Ladder, where the top was reached with relative ease. Oscar C managed to push beyond his own targets on the Climbing Wall, as he has on all the vertical apparatus. Norah’s strengths lay in her determination, grit and teamwork, so vital on these trips, whilst Evie displayed great leadership in solving problems. Allied to her natural enthusiasm for everything. Group 4 were delighted to welcome Alastair for the next couple of days and he immediately shone on Jacob’s Ladder, reflecting his own penchant for that type of activity. Lenny, too, impressed as he zoomed to the top, despite the distance between the penultimate and final rungs being significantly greater than his height. The Climbing Wall held no fears for Daniel who, along with many others, rang the bell almost before anyone noticed his climbing! Amelia kept her head when many others lost theirs on some of the problem-solving tasks, before Layla’s landing technique on Zip Wire raised the bar for the rest of us. Group 5 saw All Aboard first thing, their climbing and belaying skills improving every day, exemplified by Leah and her achievement of getting higher up than on any of yesterday’s activities. Sheryar entertained the group on the Challenge Course, caking himself in mud when taking an alternative route across one of the obstacles, whilst Anastasia used all the strength she could muster in beating the hideous army rope. Vertical Challenge followed, a sort of old-style obstacle course with tyres, ropes and ladders, only, er, vertical. Problem-solving proved a more sedate, if equally challenging finale. Group 6 headed to the Problem-Solving area to start. Jenna was an inspirational leader in many tasks; her communication skills were outstanding. The Zip Wire followed, allowing for a variety of landing techniques. 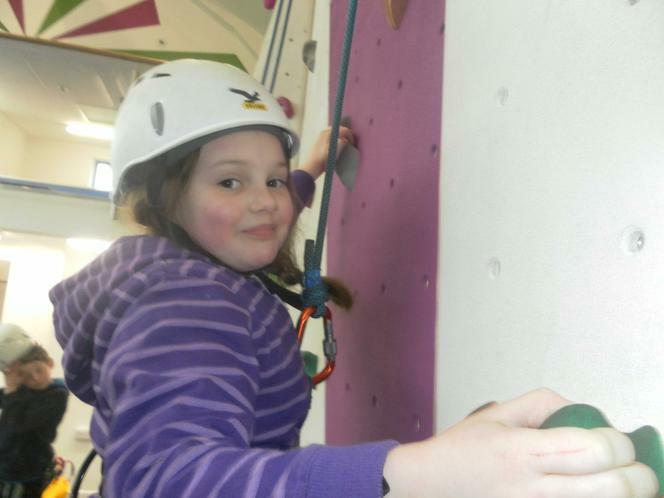 On the Climbing Wall, Lottie’s increasing confidence was marked, as she zoomed to the top twice, her smile ever broadening. Jacob’s Ladder brought the day to a close, during which Jonny’s team skills came to the fore. His team reached the top, due in large part to his fabulous communication. Group 7 began with said Vertical Challenge, before Ayaan spurred on his group through various ‘knotty’ problems with some well-chosen words of encouragement. Martha D and Charlie P battled sore fingers, aching arms and the urge to give up in their bid to reach the summit of the Climbing Wall, which was followed by PGL’s plan to single-handedly save the launderette industry: Challenge Course. My word, we’ve been blessed this week, weather-wise: another perfect ‘PGL’ day. Some looked like they were practising for Hall’o’ween a few days early as they lined up for breakfast, but the food, and noise in the dining room, soon did the trick. Group 1 abseiled first up, with Oscar M treating it like a water in the park; the group were wowed with how speedy and accomplished he looked. They then spent 90 minutes seeking ridiculous ways of overcoming obstacles on the Challenge Course. The Vertical Challenge lead to Isobel proclaiming that she’d ‘overcome my fear of heights now,’ whilst Martha H did what Martha H does: navigate the challenge with minimum fuss and maximum aplomb. Rifle Shooting then allowed for a degree of competition, plus a sit down! Group 2 replicated Group 1’s programme, whilst also welcoming Tahseen for the day. It took her no time to leave her mark, bouncing confidently down the abseiling tower. Kaye had a ‘moment’ on the Vertical Challenge, reaching the third of four sections and then questioning whether she was up to the rest. Needless to say, she was. Bertie, Max and Lydia showed no nerves as they negotiated the four stages. 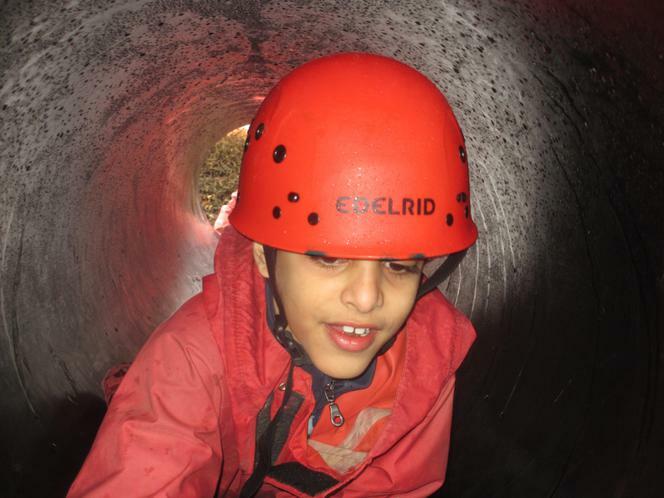 Group 3 took on the Challenge Course, with Milan continuing to display his terrific teamwork skills, ensuring that his peers were having as much fun as he was. Abseiling followed, where Liv pushed herself beyond her original targets, as she has done increasingly. The Rifle Shooting was enjoyed by all, with Aryaan keeping up morale as the week started to sap, before Zak’s performance on the Vertical Challenge was indicative of his attitude all week. Group 4 followed the same itinerary, with Daniel treating the Challenge Course as a minor inconvenience. 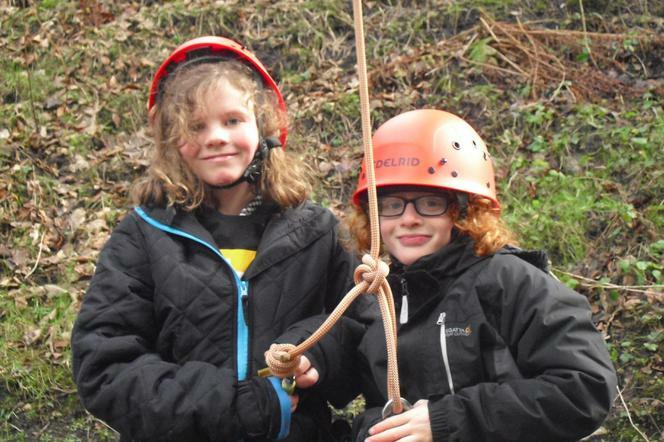 The abseiling was a complete success – Bryleigh and Sophie W flew down and received compliments from the seasoned instructors. The Rifle Shooting passed without injury, before Ella reached the top of the Vertical Challenge in no time at all. Group 5 had a wonderful time on Jacob’s Ladder. Alex W took the reins with his team, holding out hands for others to cling on to at difficult points. Henry proved a master marksman in Archery, reflective of his reputation as a true all-rounder, and all whilst showing politeness towards all the instructors. Abseiling saw Charlotte in her finest ‘Have-a-go Hero’ mode: nailing pretty much every challenge, and so supportive to boot. Isaac had a few wobbles on higher activities, but the smile soon returned when told to ‘let go and dangle’. Mitchell was a Group 6 star on the Vertical Challenge – quickly and clinically he reached the top. Jiahan completed the task in traditional fashion – with relative ease – and has supported his peers brilliantly. Holly’s belaying skills were prevalent on abseiling, and her patience and calm persona impacted on the group in a wholly positive manner. Freddie’s skills with a harness also helped to ensure that the whole group enjoyed seamless changeovers, whilst his rifle shooting was worryingly accurate. Natalie has been just wonderful – the kind of all-rounder every group needs and we have been very lucky to have her. Group 7 encountered Jacob’s Ladder, on which Mathilde’s methods suggested being a monkey in a previous incarnation. James made little fuss all week; the strong, silent type, he betrayed his nerves on the harness activities, and was a crack shot on the archery. 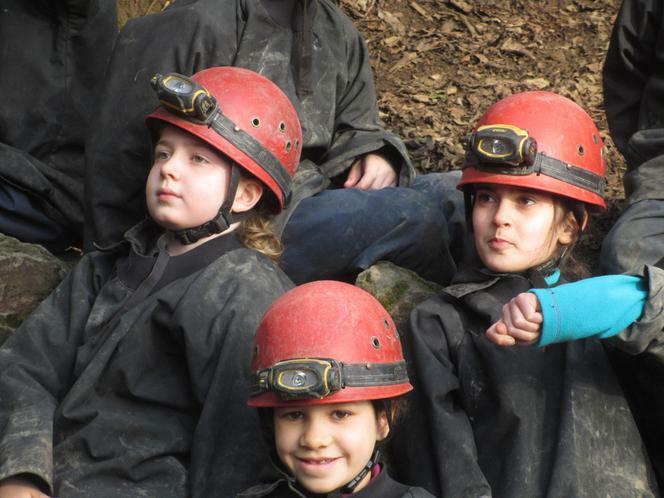 Esme showed nerves of steel when abseiling, and was the group’s token singing cheerleader. Violet was stealthy, negotiating all manner of challenges without saying a word – quietly confident. Annie’s positivity kept the group going in darker moments, and increasingly discovered what she could achieve on a personal level. The temperature had started to drop as we enjoyed a curry or enchilada and, typically, tonight was the night Ambush was planned. A huge game of hide and seek, both games were fairly epic. However, the highlight of the evening was when four teachers successfully hid from 45 children, irritating both them and Josh and Gav. Incredibly, some packing was required, before a last, most welcome sleep enveloped us all. For a minute, we wondered if the bus was going to turn up, but finally we spotted it turn into Burleigh Road and, within minutes, we were off. The forecast is promising for the week and today's skies were ideal for our wintry trip to the peaks. After a pleasantly uneventful journey, we arrived in the pub car park and were met by familiar, welcoming faces offering to make the last part of our journey easier by taking the cases up the hill. We were introduced to our instructors for the week, shown around the greatly redeveloped site and then sat down for a much needed lunch. We were split into our groups and headed out for the first time. The Badgers drove the short distance to Chatsworth House, accompanied by Miss Adams. Annabelle's adventure walk flitted between asking thoughtful questions and falling face-first into the mud. Misha kept Miss A company all the way round, pointing out interesting flora and fauna, whilst Will camouflaged himself to become immersed in his surroundings. The Foxes and Mr Willis also ventured into the surrounding countryside. Spencer threw himself into every task going, Freddie (the birthday boy) was an oracle on the local wildlife and Anna impressed with her all-round approach the first day. Mr Dudgeon and the Owls went to Moulridge Cave, out in deepest Derbyshire. Alex was somewhat anxious about the whole thing, but with the encouragement of his peers and a similarly reluctant adult, managed to navigate his way through with aplomb. Sana displayed typical character traits by tackling every challenge head on. On our return, Miles was a boon in his dorm by helping with one of the biggest challenges of the week: making beds. Mr Simmonds joined Dave and the Rabbits as they made their tentative way to Miller's Dale for the infamous abseiling bridge. George's face was as white as a sheet at the top, but willed himself to give it a go and managed two descents. Flo was confident from the off, whilst also winning the group's Most Enthusiastic Supporter award. Megan carried the gear the quickest along the bridleway to the bridge, allowing for more time to abseil. For the first time ever, we headed out for tea, descending upon a Matlock chip shop where the order was correct and the food was plentiful. On our return, we celebrated Freddie's big day with a tense game of Bingo, before readying ourselves for an all-important sleep. A light sprinkling of snow welcomed us into the day and the white stuff has been intermittently with us all day long. Our first Dukes Barn breakfast was as good as ever and we split into our groups in fine fettle for the morning's activities. The Badgers went abseiling first thing. Tabitha stuttered to begin with, but finally made her way down, Joe zoomed down whilst still shaking, whilst Leo's enthusiastic voice echoed all the way down the Monsal Trail. After lunch, Niamh was not looking forward to attempting the ghastly 'plughole' at Moulridge Cave. but squeezed her way through, much to her delight. Josef's teamwork skills were hugely positive while his manners generally have impressed greatly. The Foxes went caving first off. Matthew and Rose were brave, despite their misgivings, whilst Tristan was hugely supportive to his team. We then went abseiling, where Henry's confidence rose immeasurably in a short space of time, whilst Rebecca impressed Dan the instructor with her natural ability. 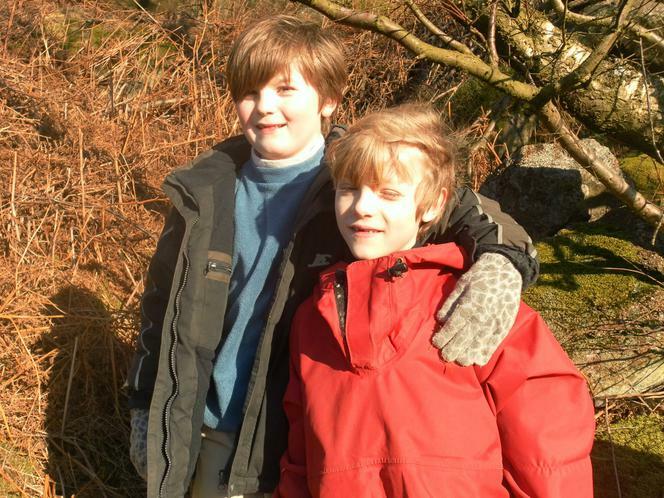 The Owls went into the hills on their adventure walk, where Bobby and Calum took everything in their stride, literally. Casper quietly got on with everything without fuss, embracing the beautiful surroundings. On the climbing wall, Josh zipped up the walls with no qualms whatsoever, before Emilia lead the way on the ropes course with great skill and determination. The Rabbits stayed on site, beginning in the climbing zone. Gabriel was very adept in all tasks, especially throwing the bean bag into the bucket. The ropes course was next, on which Zain found unique ways to negotiate some of the trickier obstacles. The afternoon brought the Adventure walk, under snowy skies and accompanied by some rather hungry deer. Tom looked an absolute mess by the end, a reflection of how much fun he'd had, whilst Esme's and Libby's energy levels knew no bounds as we headed back towards the Barn. Our second foodie trip took us to the delights of Chesterfield and one of its numerable Pizza Huts. The staff there were wonderful; more importantly, every adult we spoke to mentioned the wonderful conduct of the group. They are a credit to you all. What a glorious morning! The Peaks were at their beautiful best first thing, and we couldn't wait to get amongst it. Hang on, though: don't forget breakfast. The Badgers stayed on site. On the climbing wall, Thomas conquered his heights fear by abseiling down the wall and Charlie K scored maximum points on the bean bag game. Then, on the ropes, Izzy completed her week as she'd started: being a supportive, measured team player. The Foxes also stayed close to base. Arthur H appeared confident on every aspect of the ropes course, Elodie rarely missed with the bean bag - winning the final point for the girls team - whilst Rosa was a whizz on the climbing wall. 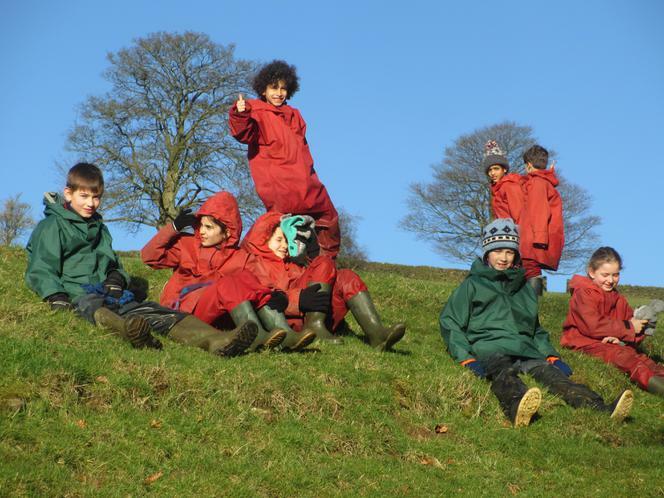 Mr Dudgeon's Owls went to Miller's Dale, which looked better than ever under the wintry sun. Beth and Edie maintained their flawless approach, tackling everything with confidence and letting nothing faze them. Arthur B zoomed off the bridge before running back up and reassuring others with kind words. Mr Simmonds and the Rabbits headed to Matlock and Devonshire Cave. Travis found the experience a real challenge, but his determination grew the longer he spent under the ground. Livia showed real strength in helping others through the trickiest parts and Connie, though quiet, faced everything full on. Remarkably, our return required a quick lunch and turnaround in order to make the departure time. Huge thanks to Mr Dudgeon and Mr Willis, who headed back home, ti be replaced by Mrs Myring and Mrs Lewis. What a wonderful group. Group 2 had arrived before we got back and were settling in. 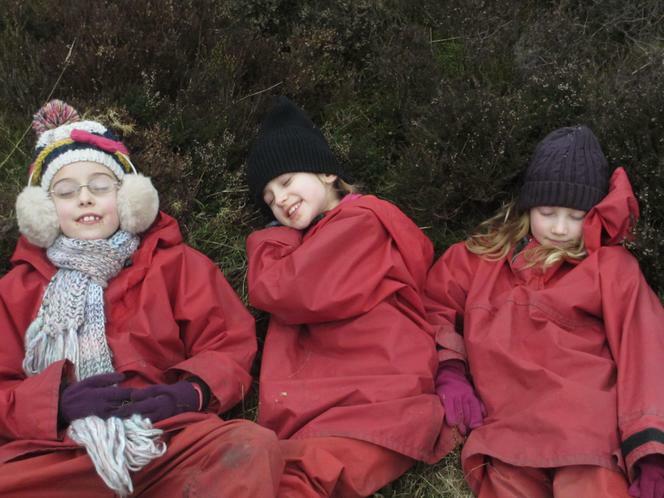 They wrapped up warm and activities begun. The Badgers and Miss Adams drove to Baslow and walked back through beautiful Chatsworth. William R showed enthusiasm and excitement for his surroundings, whilst Elsie really persevered when the going got tough. Saumya immediately endeared herself to the adults and group with her kind, supportive manner. Mr Simmonds and the Foxes walked in the opposite direction, allowing for an interesting standoff at the halfway point. George S shared his depth of knowledge with Dan, the instructor. Leo had an unfortunate coat incident, but managed to persevere despite the cold, and Flora chatted merrily with every member of the group, offering supportive comments at exactly the right time. Mrs Myring joined the Owls and headed to Devonshire cave. Emma and Lana were reluctant, to say the least, but a deep breath and some supportive words saw them brave the depths and emerge enthused. Lucio, whose help in the bed-making business had already impressed many, was extremely positive throughout the exploration. Mrs Lewis and the Rabbits went abseiling, a nice, gentle introduction to the week! Alfie bravely volunteered to tackle the bridge first, despite its foreboding reputation. Holly was more tentative at first, but, at the last moment, took the plunge and her face beamed with pride as she returned to terra firma. Sudha's calm, confident approach impressed her group greatly. A quick wash and brush-up allowed for a timely departure to Pizza Hut, where dinner was devoured with relish. We then wrapped up again and ventured up the hill on the Night Walk, before a reflective chat eased us all into the night. Greyer skies welcomed us first thing, but the rain continued to stay away for much of the day. Breakfast was typically great and hearty - the new kitchen is in full working order, we're happy to say - and we said our hellos to the Peaks. The Badgers and Miss Adams abseiled in Miller's Dale, assisted by Mark. Grace and Lucinda smiled throughout the experience, especially as they went down together. Olivia was, by her own admission, scared stiff, and had told mum she'd never do it. She was wrong. After lunch, Devonshire Cave was visited. Amidst the challenge of navigating the tunnels, Hugo and Sammy asked copious questions, some of which stumped even Mark. The Foxes also tackled Devonshire, albeit this morning, and were joined by Mr Arnold. Billy found the whole thing to his liking, relishing the opportunity to throw himself into puddles almost as high as him, Libbie maintained her approach towards the week in general, asking sensible questions and enjoying every aspect, whilst Alicia quietly negotiated the twists and turns with the minimum of fuss. The afternoon was spent in Miller's Dale and the group managed at least two descents. Edie and Evie entertained the most with their tandem performance, their giggles filling the Derbyshire air. 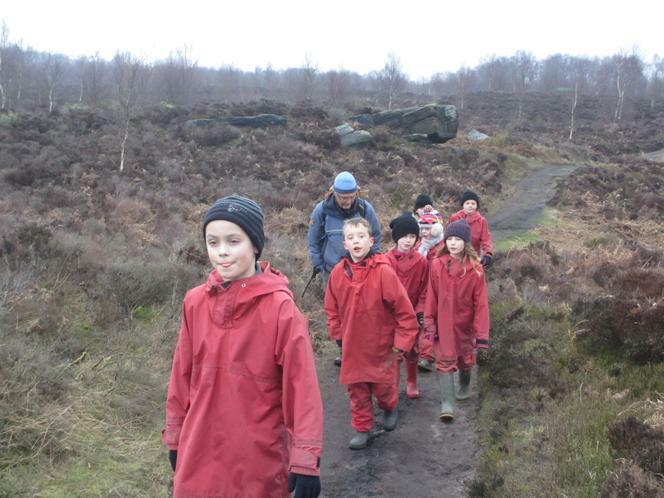 Mrs Myring's 'Owls adventure walked' this morning, heading up through Beeley Moor. Andrea powered along, leading the group up banks, through trees and along streams. 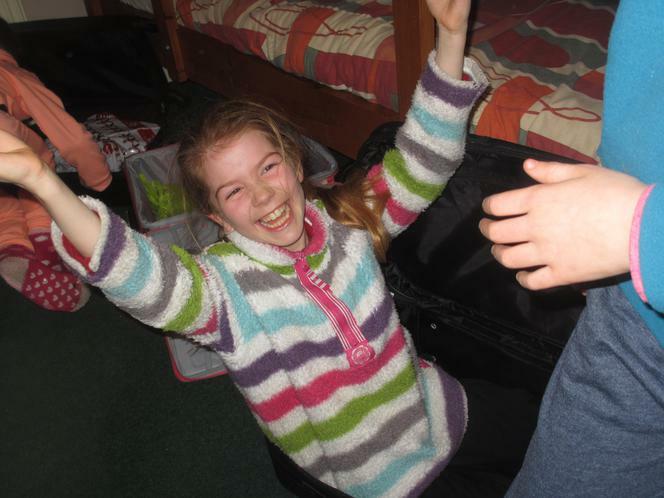 Eleanor, meanwhile, giggled all the way round, winning the prize for falling over the most. On site this afternoon, John was in his element on the ropes course, nimbly climbing through, up and over the obstacles. 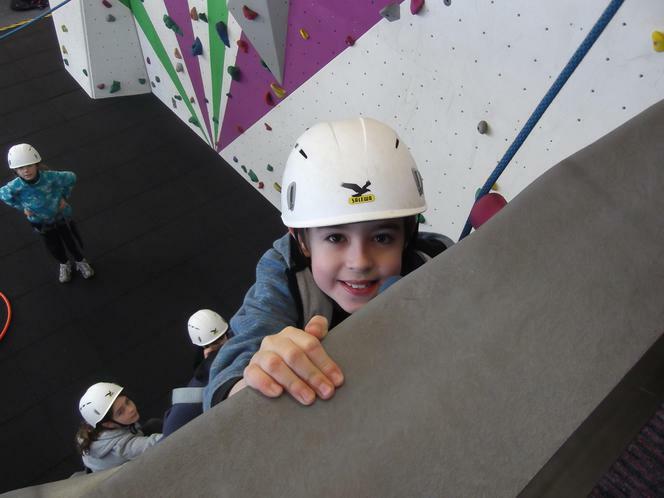 Daniel showed speed and skill on the climbing wall and won the quickest climber award. Sam R won the zip wire competition for the boys, scoring a hat trick with the bean bags in what was a very close competition. Mrs Lewis and the Rabbits remained on site after breakfast, with Finlay leading the way on the climbing wall, followed by Reuben displaying great skill and agility in the range of tasks attempted. The Adventure Walk followed, as the group explored the Chatsworth Estate. Despite the weather closing in, Alexa helped others throughout, proving especially adept at rescuing anyone stuck in the mud. William T volunteered to carry the hot chocolate flask and cups for the entirety of the hike. The end is nigh. A typically fraught pre-breakfast packing session complete, our final, epic breakfast enjoyed, we prepared for our morning's adventures. A dreary sky gave way to broken cloud, ideal in ensuring not many of us would spend our journey home covered in mud. 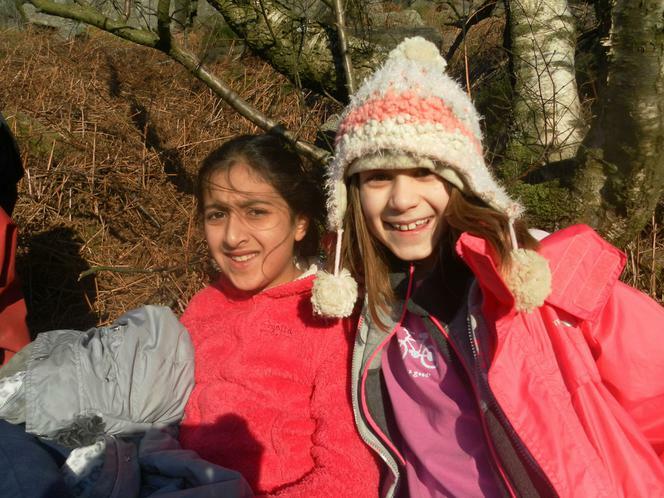 The Badgers began with the Ropes course, Dhillon and Luca used a variety of methods to clear obstacles, before the relative warmth of the climbing hall suited Lottie, whose methods on the zip wire were unconventional and successful. The Foxes alternated with the Badgers, beginning in the hall, where Samuel S maintained his record of meeting every challenge with great confidence. On the ropes, Rufus' strength proved a real bonus when the team initially struggled with the pipe and plank challenge. The Owls went abseiling, a very successful trip where the whole group flew down with no qualms, Mary and Finn M proving especially adept at keeping spirits up when faced with difficulties. Rabbits headed to Devonshire cave, where Ruby's confidence shone through, whilst Charlie R approached the task quietly and calmly. The week began at Main School where, allied to the rather intriguing colour of the sun courtesy of Ophelia, we could all sense the underlying frisson of anticipation, as the children began to arrive. The traditional game of ‘Who has the heaviest suitcase?’ ensued, before we settled in for the more mundane aspects of the day. Monies and medicines were collected, day groups revealed and only then could we relax as Rise of the Guardians kept us entertained until lunch. At slightly after 1pm, we set off on our adventure, with an added sense of the unknown on our first visit to Boreatton Park. The journey was fairly uneventful (though the last stretch along Shropshire’s country lanes appeared endless; they don’t build these places on the beaten track, that’s for sure). We were greeted by our ‘Groupies’, Leggie and Will, and were delighted to find the lodges were entirely ours for the week. We spent a short while unpacking, before the tour of the site. Our initial impressions were positive. Sausages, Steak Pie and Veg Curry were our meal options, followed by chocolate doughnuts. No complaints there, then. As the wind picked up hugely, we braved the conditions and headed out for Ambush (Giant Hide and Seek to us oldies), before settling down for a well-earned sleep. We look forward to sharing our stories of tomorrow. Most folk enjoyed a decent night, especially once the wind had died down, and there were pleasingly few latecomers to the breakfast queue. We made the most of what was on offer and now it was time to begin our activity timetable. Group 1 and Mrs Brown were thrown in at the deep end, facing the notorious trapeze, where Louis set an exceptionally high standard for others to follow. The slightly more sedate Archery target followed, Ellie deciding that the Bull’s Eye should be struck first time, much to the group’s pleasure. Abseiling after a baked potato failed to put off Dawood, who shot to the top in record time, nor birthday boy Joe B, whose technique impressed all. The day ended with the whole group avoiding any major collisions on the Quad Bikes. Mr Martin and Group 2 began with Archery, Daisy standing out with the highest score of the day. Seth’s acting skills came in handy on the Trapeze, his performance totally disguising his admitted terror in advance. Finn displayed no discernible fear of speed on the Quad Bikes, completing the course almost before he’d started, before Molly took a leaf out of Seth’s book when deciding that the best way to negate fear was to be wonderfully adept at abseiling. Group 3 and Mr Simmonds were handed the challenge of a post-breakfast Giant Swing. Rosa’s decision, after subtle encouragement, to go first paid dividends as she loved every moment. Max proved to be a rather fabulous archer, his skill helping the boys to a win in the Cricket Challenge. 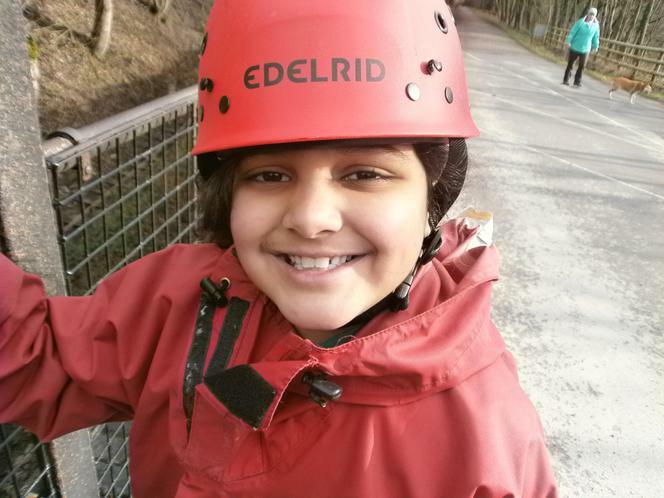 Libby overcame the horror of the initial step out onto the boards to abseil with a permanent smile, before Rajiv managed to drive a Quad with great proficiency, despite the issues he had with how he looked in a helmet! Miss Ash took Group 4 to the Archery range first thing. Amongst a very strong bunch, Charlie G took the honours for his style and finesse. Onto the Giant Swing they then ventured, where Elliot and his partner provided great entertainment as they swung 40 foot into the air. After lunch, Amelia whizzed round the quads course with aplomb, after which Zelda’s experience on the abseiling brought the whole group together: 20 mins of sheer terror at the top, before being encouraged down by the others. Scenes of great pride and courage were a fitting end to the day. Group 5 and Mrs Parnell ventured to the High Ropes first thing. Harry decided that singing ‘I believe I can fly’ would be the best accompaniment to his journey. Meanwhile, Amelie chose her own methods of negotiating the course, moving across in a variety of quirky ways. Poppy’s experience was slightly more fraught, the only person to smile and cry simultaneously! She did wonderfully. The Sensory Trail followed, with Rory displaying fine teamwork skills in keeping his group informed of each new obstacle. The afternoon comprised of Orienteering and Trapeze, affording the group opportunities to see more of the site’s lovely 250 acres from a variety of angles. Mrs Cox is with Group 6 for the first half of the week and she took them to the High Ropes to start. After they’d all given it their best shot, the group headed to the Sensory Trail, where Mae’s leadership skills and, let’s be honest, loud voice came in very handy when you’re wearing blindfolds! The Trapeze was a challenge so soon after lunch, but was negotiated successfully. Orienteering rounded off the day, with Mrs C particularly impressed with the teamwork of Sam B, Frankie and James, who all completed their course in record time and struck a suitable victors’ pose at the end. 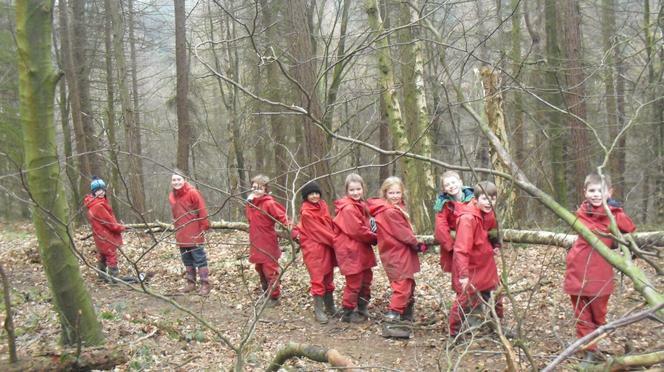 Miss Berry and Group 7 began in the woods, tackling the tough Sensory Trail in blindfolds. George L’s leadership and navigation ensured everyone survived, whilst Elias felt like being a bat or moth for the morning and nothing was going to stop him. On the High Ropes, Maisie G’s demonstrations were a sure-fire way of becoming an instructor in the future, should she wish. Noah’s motivational speaking worked wonders on the Trapeze and the whole group enjoyed seeing the sites of the park whilst Orienteering. Another day filled with memorable moments. More tomorrow. A proper autumnal morning awaited as we stepped out of our dorms. Many returned for their hats and gloves before the trek to breakfast; others, needless to say, didn’t. Group 1’s first activity was Jacob’s Ladder. This tricky challenge was made more palatable by Flora and Evie’s provision of kind words and encouragement to those whose anxieties threatened to get the better of them. Jolyon and Jack made a fine partnership in Orienteering, guiding their fellow team members around with great confidence. Once a lunch of fish fingers or sausage rolls had been devoured, they then spent the afternoon on the Vertical Challenge and Problem Solving Park, the latter providing some much needed brain exercise at the end of a long day. Group 2 alternated with Group 1’s timetable. Orienteering allowed for some early morning exercise, before Hafsah’s hard work on Jacob’s Ladder was rewarded with a successful ascent. Hannah G displayed the calm, methodical approach with which she has tackled all tasks this week, plus being a terrific support to others. After lunch, Jonas led the group with real confidence and support, and Peter pushed himself to the limit on the Vertical Challenge. Group 3 began on the High Ropes, where Chester entertained with a new version of an old classic: Heads, Shoulders, Knees and Jump. On the Sensory Trail, Hattie led the group round with clear, concise instructions. The afternoon saw Lucas zoom to the top, despite the course swaying rather too violently. 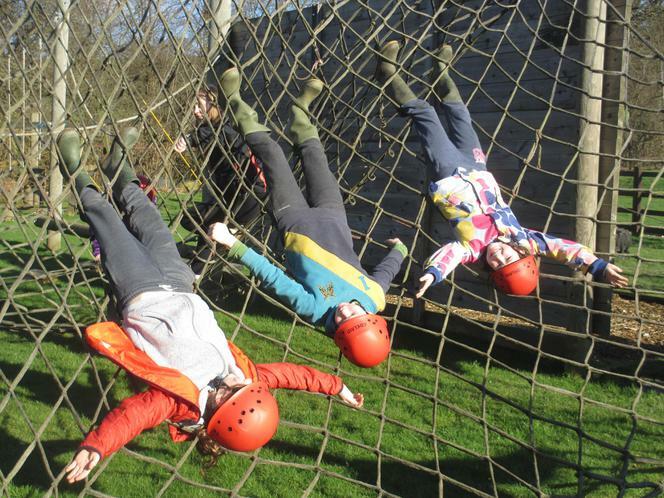 The Low Ropes were made more eventful with Beatrix’s singing – inverted commas – across the X-Factor section. Group 4 started on the Sensory Trail, followed by Liv and Rehan leading the way on the High Ropes, overcoming their own fears whilst still encouraging others. The Low Ropes followed lunch, the group helping each other round with their ‘Fists of Friendship’. Susannah impressed on the Vertical Challenge, helped in no small part by Isla who went beyond the call of duty with her belaying marathon. Group 5 had a nice, gentle introduction to their Wednesday with a jaunt to the Giant Swing. Charlie S was not happy to begin with, but the group applauded spontaneously as he overcame the odds and beamed with pride as he climbed off. The Tunnel Trail preceded lunch, after which Rory and Matt were part of a wonderful team right to the top of Jacob’s Ladder. Kitty was belayer of the day, showing the rest how it’s done. The Low Ropes were a sedate end to the day. Maisie E stole the show in Group 6’s visit to the Tunnel Trail, the tighter gaps panicking her somewhat. However, the more they fazed her, the more she did! George M then produced the best/worst/longest celebration on alighting the Giant Swing. Mrs Cox then headed home (thanks, Coxy) to be replaced by Mr Dudgeon for the rest of the week. His first experience was Jacob’s Ladder, on which he saw Maisie P and Isabella not only appear to the manor born, but also passed on their words of wisdom and support to others. Again, the Low Ropes were a suitably calm finish. Group 7, and also Miss Berry, had their first sight of the Giant Swing. There then followed a spell exploring the Tunnel Trail before lunch. The climbing wall awaited, upon which Saabit reached the top in a dynamic summit, whilst Zak bravely clambered as high as he could, despite his reluctance. 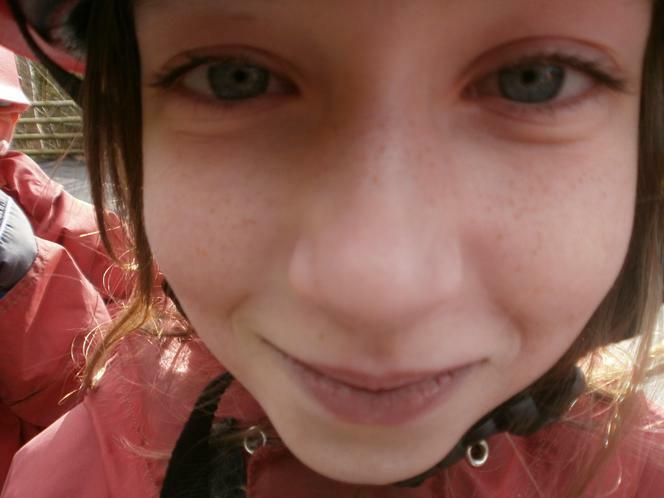 Phoebe was the star on the quad Bikes, transforming from a dissenter to supporter in no time. Dinner offered risotto, meatballs or lasagne – the former and latter receiving meal of the week votes aplenty – before we got together for a Quiz Night. In a tense affair, the boys who labelled themselves The Cabbage Dudes (me neither) came out on top. We were lulled into a false sense of security this morning, as the sun worked hard to show its face for a good few hours. Scrambled egg was a new option taken up by some, whilst others plumped for the more traditional seventeen bowls of cereal. Group 1 started on the High Ropes. Fran and Jake enjoyed it for different reasons: Fran because it was an opportunity to surprise herself as she managed to complete the course, Jake because he could walk the ropes backwards! On the Sensory Trail, Esme reassured others as much through her clear instructions as her own performance. After a sandwich lunch, Sam attacked the climbing wall with great gusto, despite the ever-worsening conditions. Mr Martin’s group were eased in with Sensory Trail, where Eve B ignored the additional obstacles provided by the instructor to guide herself and the group round. The High Ropes were challenging, but Connie and Archie proved themselves wrong and made themselves proud. The Low Ropes were fun, the group learning to trust each other in a series of tasks before the actual trail had begun. Finally, Robin’s approach to the climbing wall was indicative of his week overall: determined, calm, confident. Group 3’s day began with the Climbing wall, where Ollie B realised at the halfway point that he’d done exceptionally well, then promptly continued. Ruby B offered many thoughtful suggestions on a range of problem-solving activities. Jacob’s Ladder was even more daunting as the rain lashed down, but Lola carried on regardless, hanging on to the slippery beams admirable determination. Orienteering completed the day, Flo’s enthusiasm a real credit to her as the group squelched around after the downpour. Group 4 solved problems initially, then climbed, with Joe G flying to the top not once, but twice. Xander also impressed with his technique and enthusiasm, matching Joe by reaching the summit twice. Orienteering followed lunch, then Jacob’s Ladder saw Ruby H’s reputation as Champion Harness Helper increase, in addition to her great teamwork on the dripping ladder. 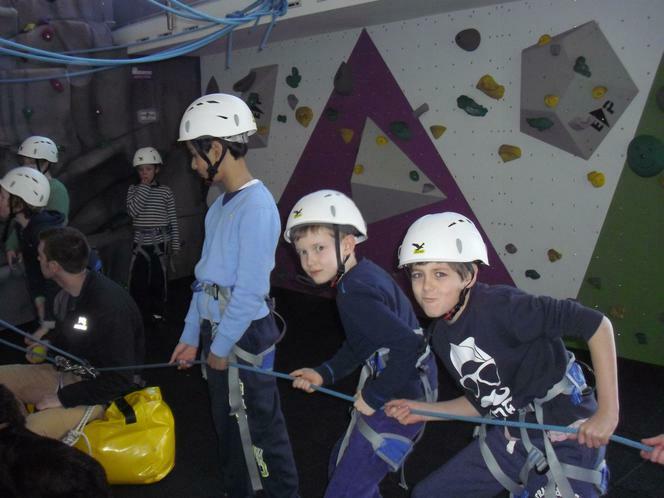 Zion managed to combine Climbing with entertaining in Group 5, his antics on the wall giving his group mates a good laugh. Meanwhile, Saffah’s first attempt was such a success that she challenged herself second time round and scaled the tower twice as fast. Melina proved herself to be a whizz on the Quad Bikes, whilst Anya the Archer had a suitable ring to it, such was her prowess with bow and arrow. Edsel had a terrific last full day, all his fears over the first few days now a distant memory, thanks to his determination and the support of his group. Quad Biking confronted Group 6, with no major mishaps. Climbing was next, with Aaron shining through not only his technique, but his willingness to support others and take advice before his attempt. Rowan’s helpful attitude has remained a constant all week; not only does he attack everything with great energy, but he has always helped instructors in all manner of ways. Group 7 started with low ropes, Sophie displaying wonderful teamwork skills. Ollie S also made sure that his team colleagues were safe and doing things the right way. Jacob’s Ladder followed, during which Eve C once again was a willing participant; she has gone first often this week, even when feeling apprehensive. Aayan’s technique on the abseiling ascent drew warm applause, taking a few risks by pushing away from the wall whenever possible. Millie has been the group’s helper-in-chief, often assisting with other’s harnesses and other equipment. As ever, the shock at how quickly Thursday evening came around was stark. However, we went for our dinner with the disco still to come. Chicken Kiev, Cottage Pie and Vegetarian meatballs were the option tonight. And so it came to the disco. As usual, we saw an almost 100% participation, staff included. There were many tired bodies wending their way through the drizzle, all ready for their sleep. Crikey. Is that it?! As we lugged our cases to the empty room near our dorms, there were noticeable looks of disbelief that Friday had arrived so rapidly. Still: up and at ‘em”! One last breakfast filled us up and we were ready to embrace our final day. 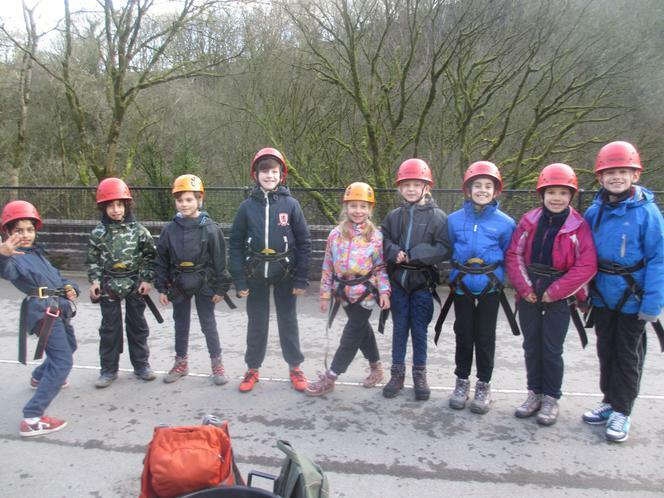 Groups 1 and 2 took on the Tunnel Trail and Giant Swing, 3 and 4 the former and Trapeze, whilst 5, 6 and 7 solved problems and climbed the Vertical Challenge. Each member of staff pointedly proclaimed that their group had been great fun all week long, a real testament to how they have all made the most of their trip. And so it begins. Another year at wonderful Dukes Barn. There were no mishaps in terms of forgotten cases or lunches, and the bus actually turned up early; a unique event! Sadly, Mrs Cox and Miss Adams were unable to accompany us due to illness, but will be joining us as soon as they feel up to a week with 40 children in the countryside...! As we headed into Derbyshire, the clear skies were shrouded in fog, adding to the sense of mystery and anticipation of all. A couple of sickness issues aside, the journey was smooth and we arrived at 11:15. We were introduced to the usual, welcoming faces and began to find our bearings. Once we'd been split into our groups, we gobbled down our lunch and prepared for our first activity. The Badgers, escorted by Colin, Mrs Parnell and Mr Simmonds, headed out to Robin Hood rocks for an Adventure Walk. Never has a moniker been so apt, as it turned into more of a rock climb and scramble. Leah's confidence grew hugely throughout the route, eventually ignoring any offers of help, whilst Sophie Wynn proclaimed that she 'couldn't do it', whilst actually doing everything. Johnny was calmness personified, managing to lead the group round the challenging route, yet still holding on to the hot chocolate cups. Miss White and Andy went with the Foxes on their adventure walk up the hill. Raul caused much mirth by his actions, entertaining the group in all kinds of ways. Charlie P made his way up a rather steep hill, only to return from whence he came; at no point did the smile leave his face. Zak proved himself to be the Marco Polo of the group, finding the way and leading the rest of them through the woods. The Owls headed to the notorious Giant's Hole caves, along with Mark and Mr Summersby. Lottie was slightly wary of crawling through the trickier gaps, but soon got the hang of it and enjoyed every minute. Phoebe took on the role of leader on the way back, a highly challenging job embraced with relish. 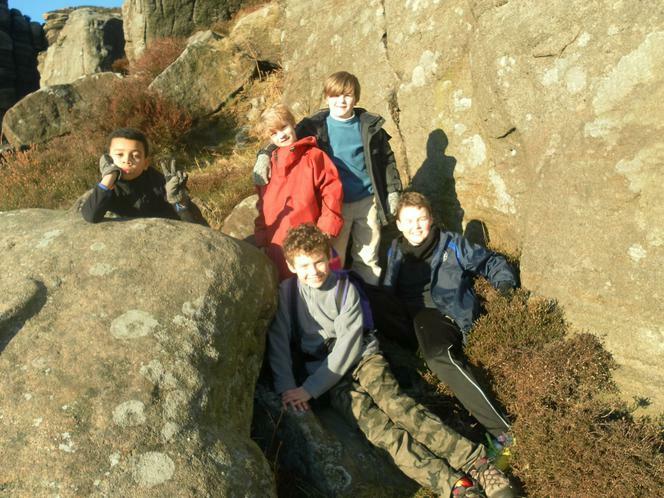 Liam's knowledge of rocks and caves kept the group enthralled. 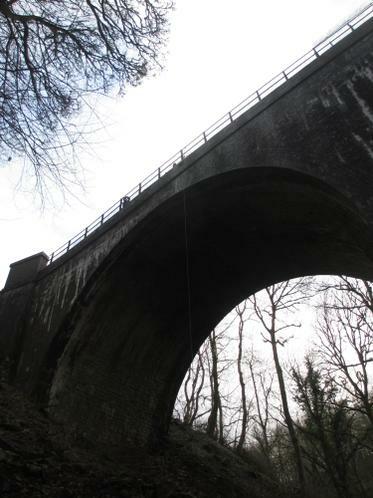 The Rabbits headed to the renowned Miller's Dale to abseil off the bridge. Emily volunteered to go first when it appeared that no one would go at all! Ji Ji got through the fence, only to climb back through initially. However, at the end, she tried again and, this time, sailed down with great pride. Aryaan proved a valuable team member, maintaining his enthusiasm and supporting others at times of most need. The weather closed in towards dusk, so we decided to lock the world out tonight. A dinner of Fish Fingers was followed by the first of the Barn's incomparable puds: Chocolate sponge with chocolate sauce. Immense. Bingo night followed our first dorm inspection, with Esme and Freddie victorious. We are now settling down for the night, excited about what tomorrow will bring, but recognising the need for sleep first. As always, we were fed royally and headed off on our morning activities in high spirits. The Badgers abseiled from the dreaded bridge. Bryleigh was not keen, to say the least, but gave it a go and lived to tell the tale. Dan and Rais both got four turns, smiles increasing with every descent. After lunch, they took on Giant's Hole. 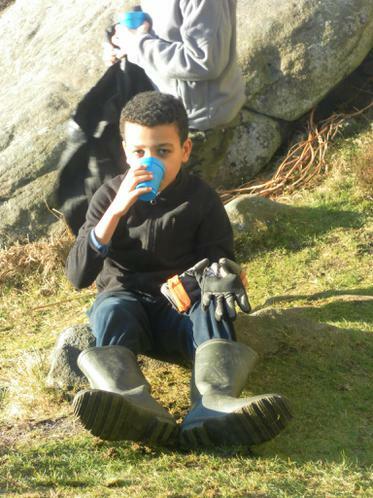 Alfie T displayed calm and a great deal of understanding of Derbyshire geology, whilst Amelie E and Shelby broke records for falling over onto rocks without causing themselves harm. Miss Adams arrived to spend time with the Owls. 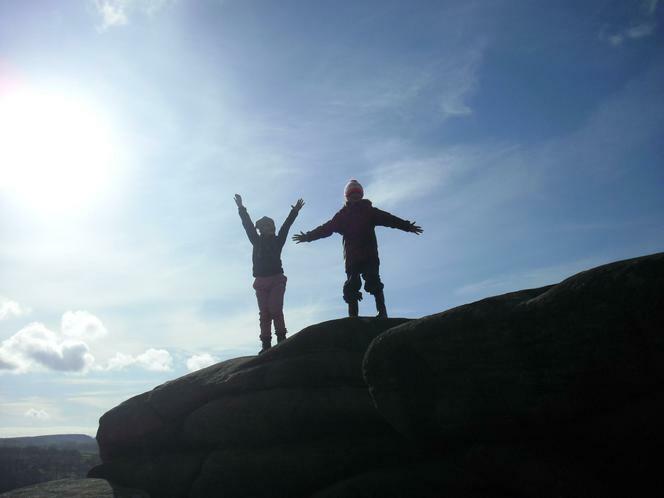 They began on an Adventure walk, high above Chatsworth on this beautiful winter's day. Aayan was covered head-to-toe in mud, though not a hair was out of place by the end! 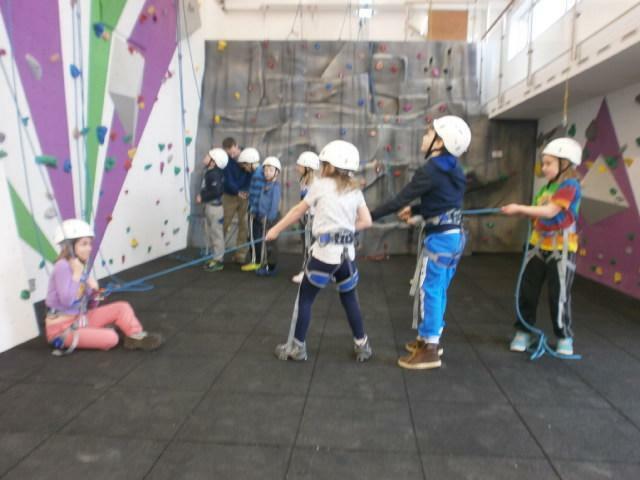 The afternoon saw them on the Climbing Wall, during which Mia shone on the Zip Wire, before they defeated the Ropes Course with aplomb; Charlie G's team work skills were pronounced and Norah lead the way on the Tunnel Trail. 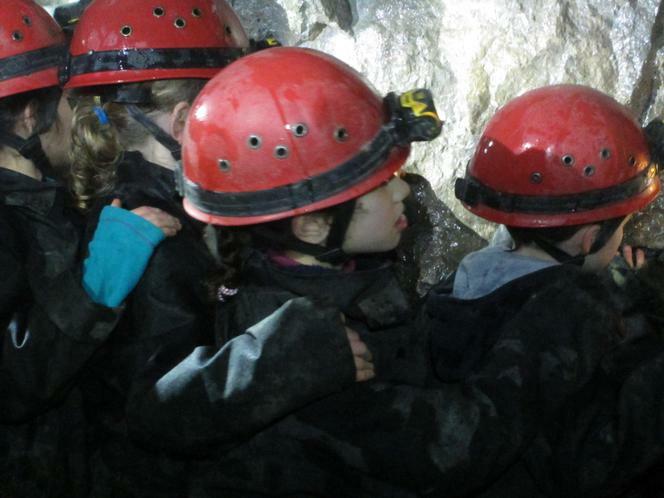 Miss White and the Foxes visited the caves at Giant's Hole after breakfast. Amelia M had severe apprehensions. However, with the help of her team, she managed to get through unscathed and with positivity. The afternoon saw the group abseil. Layla and Mathilde were reticent, to say the least, but their fear of heights did not get the better of them and they loved the experience. Mr Willis and the Rabbits went on the Adventure Walk first thing, accompanied by Mr Simmonds. Missy was a star, constantly keeping everyone up beat and earning a deserved wash in the waterfall above Chatsworth. Jacob lead the way for much of the trail, ensuring everyone arrived home safely. After lunch, the group spent time climbing and tackling the Ropes Course. During the former, Freddie showed great aptitude, described by Dan the instructor as a 'natural', Amelie W and Max were great team players on the Ropes, offering sensible suggestions towards negotiating the many varying challenges. A busy evening saw sausage and mash devoured, and profiteroles were hugely popular. This was followed by a visit to the Gift shop and our obligatory Night Walk, where the entire group followed instructions flawlessly and, subsequently, became 'Friends of the Dark'. It's now bedtime and we are sleeping soundly, before our final session tomorrow. Slightly grotty weather greeted us on our third morning, but didn't last too long, thank goodness. Not that we got out too early; the packing process was somewhat manic. However, rooms were emptied just in time. Breakfast was as wonderful as ever and we set out on our final morning. 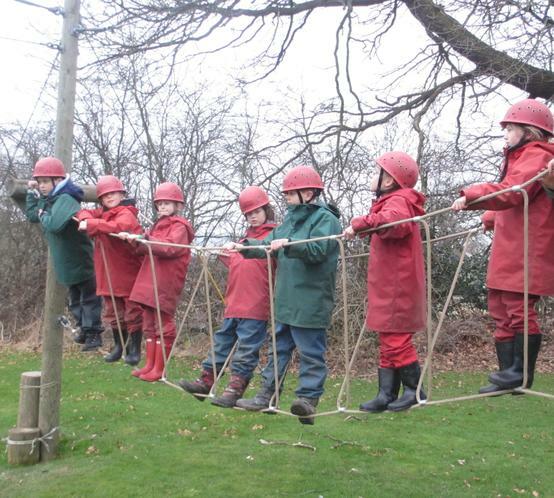 The Badgers stayed on site, first encountering the Ropes Course. Esme's calm persona was tailor-made for such a challenge, offering sensible suggestions to solve problems. 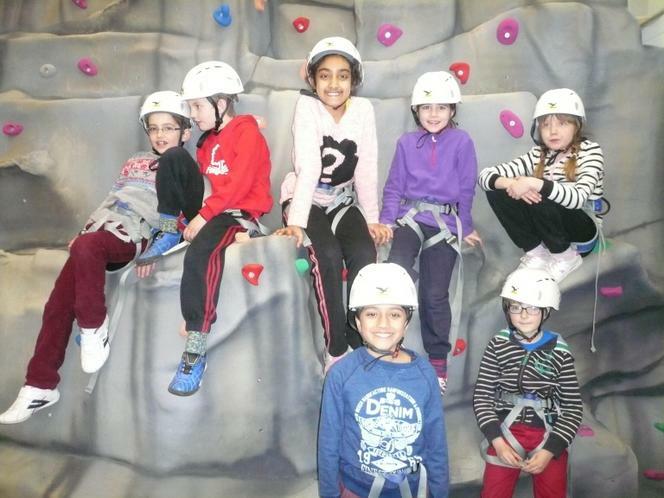 The climbing wall was the most successful activity of the week: all the group completed every challenge with minimum fuss. Arian K's aim with the bean bags on the zip wire was particularly impressive. The Owls went abseiling with Niamh, Dylan and Aniyah coming to the fore with their incredible perseverance, despite considerable fears. Lottie managed to smile throughout the descent, whilst Milan was the Chief bucket carrier on the long trudge to and from the bridge: a highly valued role. The Foxes remained on site. The climbing wall provided an opportunity for Annie and Ben to show off their speed, whilst James was a hot shot with bean bags on the Zip Wire. On the ropes course, the group worked well together to negotiate the obstacles, with Liv and Charlotte encouraging each other throughout. 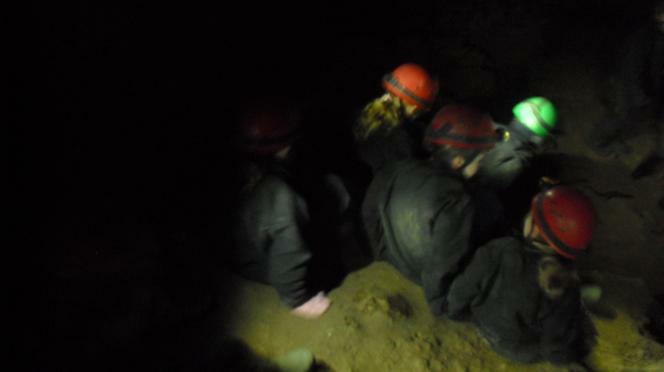 Mr Willis' Rabbits went visited the caves near Castleton. Josh and Natalie used some alternative methods to find their way through the trickier sections, whilst Sophie W managed to stay dry, despite her best intentions! A final lunch was enjoyed, before the usual mayhem of distributing lost property. Don't blame us, parents! The two groups passed each other like ships in the night and our first half left for home, tired yet full of lifetime memories. 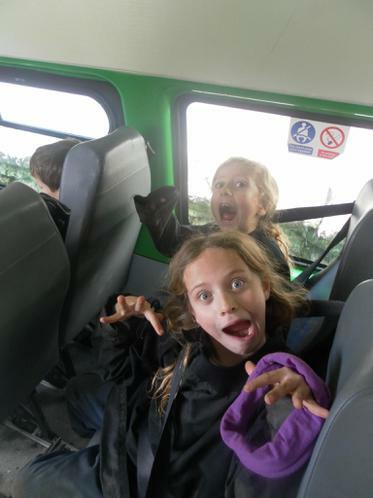 Group Two's default setting was boundless excitement as they began their adventure. 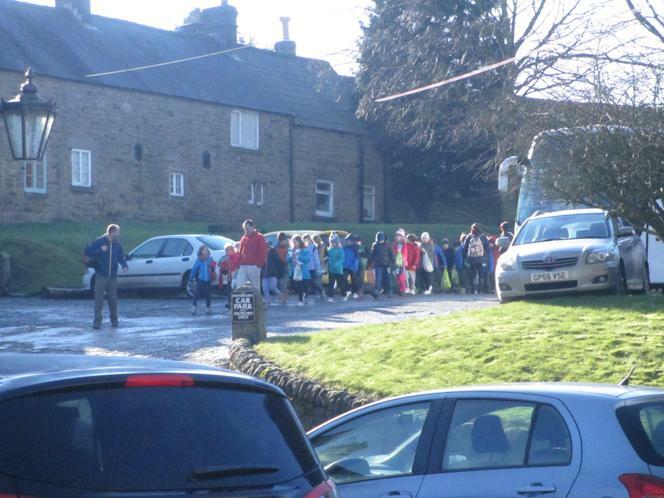 The Badgers drove up to Beeley Moor to begin a walk down the hill. In treacherous conditions, Cas found new ways to fall over, Kaye was the key to finding our way whilst Anastasia just delighted in the surroundings and would've stayed out all night if allowed. The Foxes, joined by Mrs Myring, were bestowed the honour of walking up the hill, rather than down. 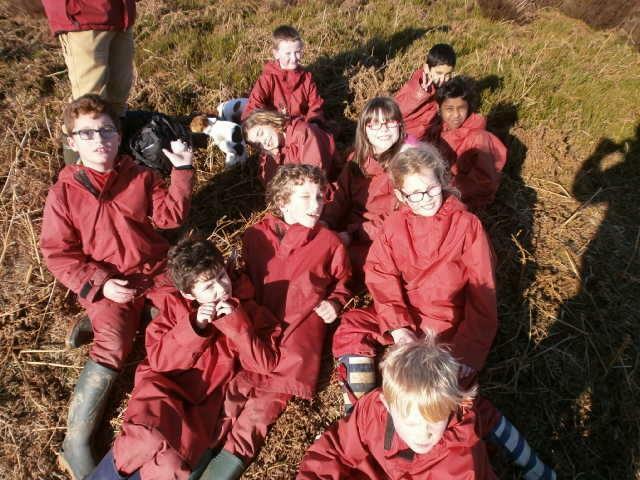 Sean was a star, retrieving many a teammate from the deep mud; Beatrix was the map reader who helped us find the minibus at the top, whilst Alfie N's prowess for helping his dorm make their beds was the talk of the group. The Owls went to Giant's Hole. Alfie L felt unwell on the journey to enjoy the experience, whilst Daniel's teamwork skills enhanced the group's experience, especially an initially reluctant Miss Adams. Ms Stephenson and the Rabbits faced up to the bridge at wonderful Miller's Dale. Alastair showed great courage to give it a go and waxed lyrical once he'd reached the bottom. Holly was hugely supportive of her team and full of enthusiasm for the challenge. 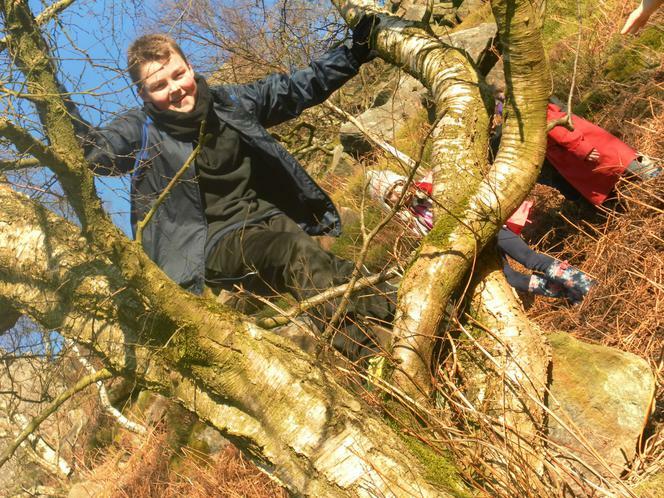 Sam W was one of the many beneficiaries, as his fear of heights initially held him back; his determination to succeed made his group very proud. Pizza and chips, followed by a wonderful sticky toffee, ensured we were more than suitably fed, before a trip to the gift shop and a thrilling game of Bingo ended the day. Day 4 begins after a largely peaceful night. Breakfast was ordered and promptly wolfed down, and we met our instructors for the day. The Badgers went to Miller's Dale, which looked splendid under a faint smattering of snow. Martha and Oscar M needed encouragement, but managed it to great cheers. After lunch, we went to the caves, along with Mr Arnold. Thomas and Alex W were great leaders, and listened well to Colin's instructions. 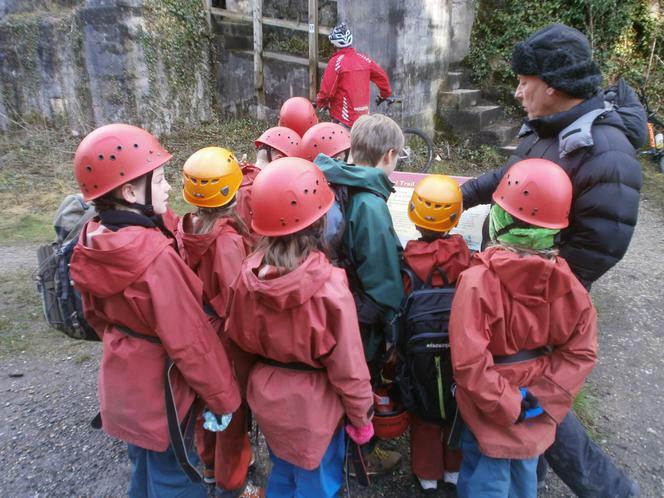 The Foxes enjoyed caving then abseiling today. Juliet really found her feet; the group could barely keep up with her in the cave! Theo's approach to the caving was one of calm, methodical enjoyment, much needed qualities 50 feet under the earth's surface. 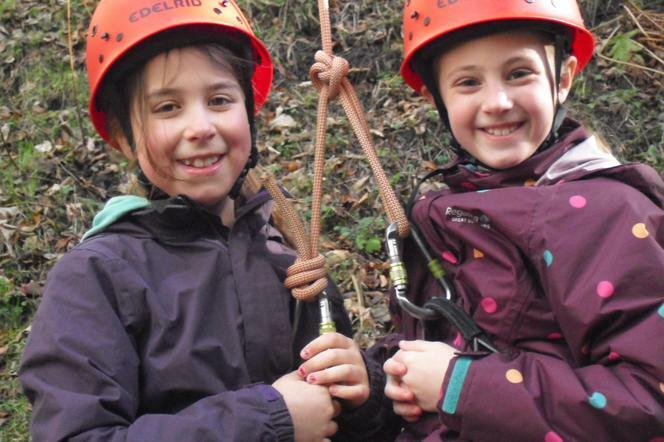 Gigi and Mathilda showed incredible bravery and determination during abseiling, and are still talking about it now. The Owls went on a yomp this morning, seeking out parts of Chatsworth few others have found. Henry and Jenna were the key to a successful conclusion: arriving home without getting too lost. Isaac was a trooper on the climbing wall, managing every task despite one hand being out of action. Isabella and Evie, as they have all week, provided great entertainment for the group, simply by being themselves. On the Rabbits' walk, Oscar C and Bertie oozed positivity and enthusiasm, keeping the group going through some tough stretches. 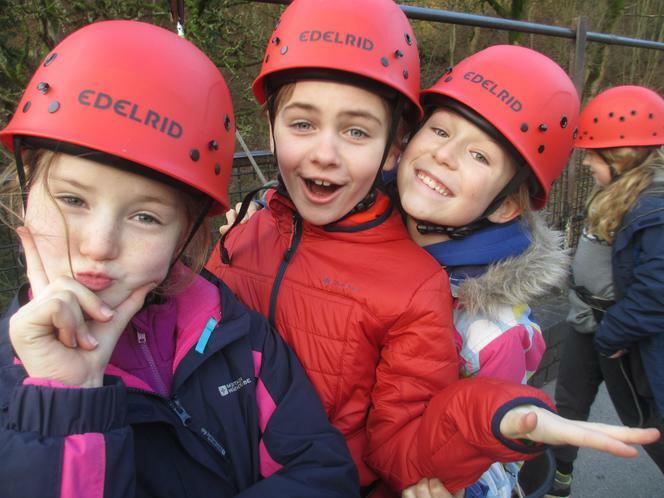 Isobel, Ella and Martha D starred on the climbing wall and ropes course, a sign of their lovely friendship throughout the week. Spaghetti Bolognese was good; apple crumble and custard was incredible! We then spent a short while packing (yes, packing!) before we quietly made our way up the hill to become a Friend of the Dark. A lovely day all round and still a morning to go before our sad departure. A mixture of excitement and disappointment dominates as we pack our bags: the anticipation of seeing family again, whilst not wanting the week to end. However, no one is disappointed with breakfast; no one coming here ever is. The Badgers and Foxes stayed on the Barn grounds all morning. Lola C and Violet performed admirably on the Zip Wire, managing to throw bean bags in the general direction of the target, despite eyes watering with laughter. Meanwhile, Max C and Jiahan lead the group sensibly around the Ropes Course, whilst Alex R found some unorthodox ways of solving problems. Miss Adams and the Owls went abseiling, a suitably high-impact finish to our trip. The whole group impressed with their positivity, Kitty and Lenny overcoming a few wobbles to make the most of it. Sam C-H proved to be a champion at encouraging and cajoling, in addition to his own skill and agility. 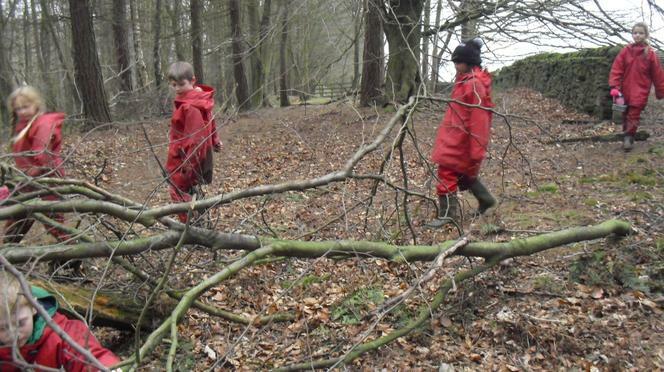 The Rabbits encountered Giant's Hole, but not before a 1/4 mile walk from the minibus during which they braved a wind chill rarely experienced in their lives before! Georgia asked plenty of thought-provoking questions in the cave, whilst Iris kept the group entertained through the trickier parts of the trail. Surprisingly few packing mishaps allowed for a prompt departure for home, but not before an opportunity to thank everyone at the Barn who, as always, do all they can to ensure a visit that will remain with many of us for the rest of our lives. The weather smiled upon us this morning, as we made the most of Cottages being kindly vacated by Year 5. Day groups were revealed and it was lunchtime before we knew it. We then collected our cases once more and enjoyed a smooth journey to our home for the week. We settled into dorms, before a guided tour of the site under a perfect autumnal sky. We have been assigned the late slot in the dining room, so dinner was eagerly anticipated for quite some time. Eventually, we chose from macaroni cheese, bangers and mash or chicken curry, followed by an energy-replenishing raisin and cinnamon cake. Our old favourite, Ambush kicked off the evening itinerary; the teachers enjoy this one as much as anyone. An early night is required, however, in readiness for the particularly high impact activity timetable we have planned this year. We awoke, after a great sleep, to miserable weather, something that wasn’t to change pretty much all day long. However, bacon, hash browns and tomatoes lifted spirits, and we headed to our first official activities of the week. We were privileged to be joined by Tasnim and Ananthika for the day. Group 1 and Mrs Green were first to head to the feted Trapeze. The whole group shone, with special mention to Riya, who succeeded through sheer bravery; Joe F, who admitted nerves but eventually did it like an expert, and Harry H, who even received an ‘Awesome’ from his impressed instructor. Archery provided the requisite calm after such a high-impact start. Group 2, accompanied by Mr Dudgeon, began with Archery, Mo standing out as the first in the school to score a Bullseye. They then took on the might of the Trapeze, Lottie stepping up, despite understandable nerves, and going first; catching the trapeze itself just reward for her bravery. Miss Chapman and Group 3 started up on the dreaded Trapeze. Oliver W proved to be a master, taking a deep breath and making a mockery of the obstacle’s reputation. Archery preceded lunch, during which Finn displayed the confidence and leadership skills prevalent in all he did today. Group 4, accompanied by Mr Martin and Miss Rimington, tried their hand at archery, in which Jakub displayed admirable hidden talent. They then took the Trapeze head on where, despite the rain, Tasnim and Bettie stood out with their sheer grit and determination. Group 5 began their week on the Trapeze, Lucy reaching the tiny platform in the blink of an eye. Nina showed immense courage in reaching up to touch the platform, then having a ‘wobble’, before independently completing the task with much encouragement. Archery was enjoyed before lunch, a shelter from the wind and rain. Group 6, and Miss Ash, headed to the archery hut first, Ed backing up his knowledge of the sport by hitting the bullseye twice. They then headed to the Trapeze. Thea and Amelia were bags of nerves; however, both reached the top and made the Leap of Faith. Group 7, with Mr Arnold, were also presented with the rather daunting Trapeze to ease them in, not at all gently, to their activity programme, Oliver Brand starring with his technique and confidence. They then dodged the drizzle in the Sports’ hall, learning numerous traditional fencing moves. Our late lunch slot was a while in arriving, but the pasta bar ensured that we approached the afternoon with renewed vigour. Group 1 fenced for Session 3, enjoying the warm and looking the part in their proper protective clothing. The Climbing Wall awaited to complete their day, Danny putting his vertigo to the back of his mind as he outdid his target, and then some. Group 2 began the afternoon on the climbing wall. Dylan put on his full squirrel impression as he zoomed to the top in no time, whilst Poppy spent a while pondering a return to terra firma before taking a deep breath and reaching the top to huge applause. Group 3 fenced, a steady activity to attempt so soon after a hearty lunch – Ben was generally regarded as ‘The Man’ here. The day ended with the Climbing Wall, Mila showing the kind of perseverance that is necessary throughout weeks such as this. Group 4 climbed, with Hamish proving to be hugely adept in both style and speed, before the day ended with fencing, and an opportunity to play fight and get away with it! Group 5 and Mrs Brown fenced after lunch, the group enjoying dressing up in the somewhat eccentric outfits, before heading to the climbing wall to complete the day; Samuel Lowe and Adam C weren’t keen, but determination won the day and they made it up a good way. Group 6 climbed after food, with Sam Bishop displaying great agility and enthusiasm, something which has shone through in everything he has done thus far. They finished with fencing, a welcome 90 minutes in the dry. We made the most of our late dinner by having well-earned dorm time, enabling many to take a much-needed shower and begin to plan for the morning’s impending Dorm Inspection. The evening saw us take part in a game of Outdoor Cluedo, encompassing much of the site, in which teams had to work together to find the culprit. The rain had returned by now, but much fun was had by one and all. Many thanks to Mr Dudgeon, who now heads back to school as Mr Simmonds returns for the rest of the week. Bedtime now, with more delights in store tomorrow. First thing’s first: let’s all check the weather. Thankfully, we were met by a more archetypal PGL scene: blue sky and sunshine. So, with a decent sleep behind us, we headed to breakfast and a plate of hot food to set us up for another full day. We welcomed Sajid for the day and Mr Summersby for the rest of the week. Group 1 began on the infamous high ropes; Esme managed to complete the course independently, despite her initial concerns, Katie used her experience at yesterday’s climbing wall to ensure she kept on going today, whilst Izzy recognised the value of the harness in ensuring her safety, allowing her to breeze round the course. The Sensory Trail provide many a laugh before lunch. Group 2 were now joined by Mr Simmonds and began with the Sensory Trail. As always, this entertained everyone royally. Will lead the group through the tricky opening with clear instructions. High Ropes followed and the whole group impressed with their willingness to give it a go; Zain’s face on reaching the end was a joy to behold. Group 3 also headed to the High Ropes. Tom gave us his finest Tarzan impression, swinging round the course; this was replicated by the entire group. They then took on the Sensory Trail, with Amy leading the blindfolded group with confidence and clarity. 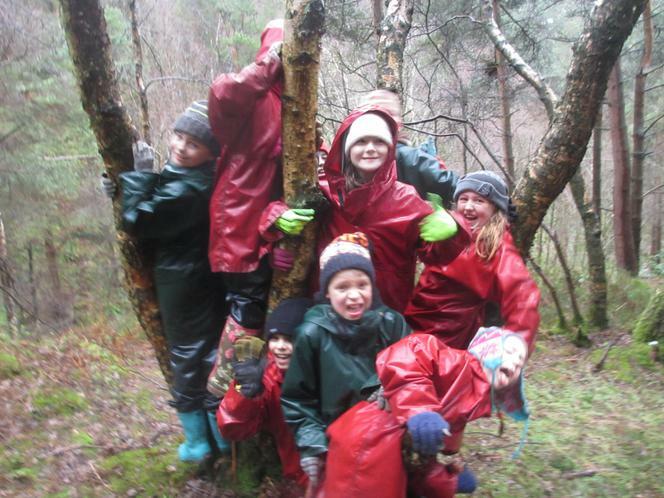 Group 4 were deep in the woods to follow the Sensory Trail, an activity which always causes mirth among the adults, as they can provide additional obstacles to an already tricky course. High Ropes were next and provided much drama, though Jake and Harrison swept round with great serenity amidst the general mayhem. Group 5 had a gentle start at the Problem-Solving zone, where Amelia G orchestrated the group thoroughly and impressively. The Sensory Trail followed and was much loved by all; indeed, they made it further down then many other groups this week. Group 6 were blindfolded on the Sensory Trail, where Caylan led the group with fabulous, calm authority. They then spent the next session solving a variety of problems, displaying great team skills. 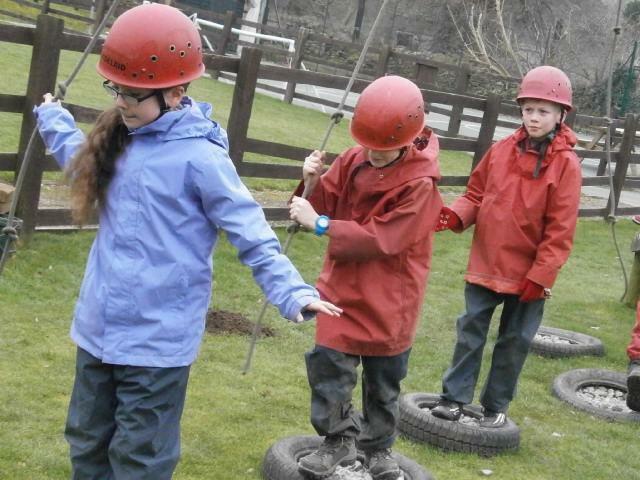 Group 7 faced the Challenge Course, where the teamwork improved considerably as the activity progressed. The highlight of the group’s morning was Vince’s performance on the Quad bikes, where he soon assumed the nickname of Crash Test Dummy, such was his propensity to drive directly into the protective tyres! After lunch, Group 1 attempted Vertical Challenge, on which Sulayman not only shot up the course, but also embraced the opportunity to swing on the rope in a variety of ways. The group ended with the Challenge Course, a fitting way to complete a successful day. Group 2 followed lunch with a trip down the hill to the Challenge Course. Owen’s willingness to take the lead and guide the group down ensured that the obstacles were negotiated with skill. The Vertical Challenge was a high-impact conclusion to activities. Meg zoomed up with great aplomb, whilst still managing to support others. Group 3’s afternoon began with the Vertical Challenge, on which Oliver Birkitt and Jonathan displayed fine perseverance and stamina on the tough, and varied climb. They finished with the Challenge Course, an opportunity to apply many of the skills they’ve picked up thus far. Group 4’s first task in the afternoon was to negotiate the Challenge Course, with Oliver G pulling out all the stops in a very athletic manner. The Vertical Challenge brought to an end a hugely eventful day. The High Ropes lay in store for Group 5. Mahad and Leo were very competent, the former after an apprehensive start. This set the team up for the Challenge Course, where their improving team work became more prevalent. Group 6 spent the afternoon at the Challenge Course, with Sara leading the way across the various obstacles, and High ropes, on which Kate continued to embrace every challenge set so far, whilst Ellie provided great support for Miss Ash, who wasn’t keen in the slightest. Group 7 were awarded the somewhat dubious pleasure of a post-lunch swing around the High Ropes. Harry S bounced back with great courage after a difficult start, whilst Chloe provided the team support, recognising when to shout encouragement and when to offer praise. The Sensory Trail was a welcome light-hearted end to the day; Billy was a great leader in ensuring the group were not overly handicapped by their blindfolds. Dinner was good, with the home comforts of chips and fish fingers or gammon. Then a real throwback for some of us: Angel Delight. And, yes, it’s still unfathomably edible! A late change in the schedule saw us head to the Disco. The PGL veterans amongst us were in total agreement that it was the best yet, as every single person truly went for it on the dancefloor. Special mention must go to Enya, who simply never stopped for 90 minutes. As we prepare for bed, we must pass on our thanks to Miss Rimington, who heads home tonight. As for the rest of us, many more highlights await. Again, the weather was decent when we rose first thing, and tales of the disco resonated as we made our way to breakfast. The need for food remained clear, as fewer leftovers lay on plates than on previous days. Mrs Green and her Group 1s went abseiling, during which a number of stars emerged: Charlie bunny-hopped his way down second time, Noah was the first of the group down, whilst Aaron simply had it all in terms of technique. Quad Biking followed and Kyron, who admitted to nerves, quite brilliantly negotiated his way round. Group 2 and Mr Simmonds ventured to the Quad Bike track. Whilst those waiting amused themselves with comedy and musical classics, Lewis proved adept at the controls, despite forgetting the break on occasions. Abseiling was next, and the group as a whole were fabulous; Isabel was a champion both on the wall and disconnecting the ropes from others. Group 3 abseiled first and, amongst a rather talented bunch, Olivia used her confidence and skill to great effect. On the Quad Bikes, Rowan listened attentively, allowing him to pick up the techniques very quickly. Group 4 went Quad Biking to start the day; the whole group were great, but special mention to Scarlett, who possessed a natural talent for driving which even she never knew existed. Abseiling followed and a high standard was achieved by many, in particular Georgia, who maintained her record for the week of simply doing everything. Group 6 began with Quads and proved themselves expert, before it was Hermann and Josh’s turn to take centre stage on the abseiling wall, where they overcame rather prominent nerves to eventually descend many times. Group 7 were joined by Mr Summersby this morning and attempted the abseiling wall. Bani was a star, showing no fear and also helping others. Problem Solving was up next and Harry S put into practice the teamwork skills he has acquired this week. Some groups enjoyed, or endured, the annual organised chaos that is the visit to the PGL shop, whilst others had some dorm time before a lunch of jacket potato and various fillings. Group 1’s afternoon was ideal after a big lunch. They worked it off by following the clues on a map of the site in Orienteering, before displaying their more cerebral side in Problem-Solving. Group 2 also had a more sedate afternoon. Marc enjoyed leading his group round the campus on the orienteering project, before Reuben used his, shall we say, strong voice to good effect when the group were faced with logical and physical problem-solving tasks! Group 3 alternated with the two former groups, beginning at the Problem Solving zone – Joe F shared thoughtful and logical ideas to help his team through the many curious challenges. Orienteering then allowed Ruby to thrive with her terrific map-reading skills. The Problem solving activities encountered by Group 4 were accompanied by four seasons’ worth of weather, wherein Skye quietly, but confidently lead the team wonderfully. The Vertical Challenge awaited, ready to dig its claws in, so to speak, but the group laughed this off, Bronwyn and Zeeshan combining skill with fabulous support for their peers. The Vertical Challenge also tested Group 5, but, despite one or two wobbles, they all gave it a real go. Iona continued her quest for the title of ‘all-rounder’ of the group for the week, whilst Beth shot up, and I quote, ‘…like a rocket!’ Finally, it was time for the Giant Swing, which everybody gulped on seeing it in action, then had a go anyway! 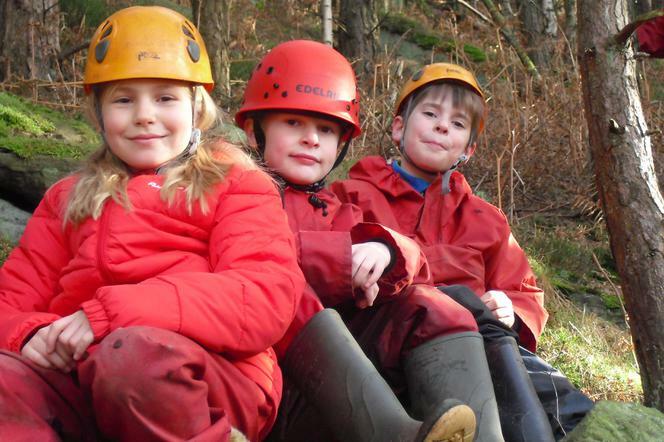 Group 6 became the first to meet the Giant Swing and its rather dubious reason for existence. Rachel stood out for her enthusiasm and willingness to get as high as she could, before pulling the rope of doom. As it should be called, at least. The Vertical Challenge completed a very high-impact afternoon for the group, on which Edie not only starred, but also proved a hugely efficient belayer. Group 7’s time on the Vertical Challenge was a huge success, with everyone reaching their own target, whilst recognising the importance of supporting the others with their rope work. The Giant Swing is also an activity which cries out for effective leadership and hard work. Step forward Evan who surprised no one with his positive support of others, as well as his determination to succeed himself. Remarkably, the next hour was a chance to pack, yes pack, in readiness for tomorrow’s departure, plus shower time for those who, just as remarkably, had not previously done so! Dinner was regarded as the best of the week, with meatballs, vegetarian pasta or turkey escalope on the menu. The Rice Pudding was also good, much to the surprise of many of the older members of the school. We are now enjoying outdoor Wacky races, a final opportunity to go mad in the name of team sports, whilst dressed in all kinds of ill-advised garb. However, soon we will be in bed, slightly earlier, in order to be ready for a 7 o’clock start, and even busier morning than usual. As we head towards bedtime on our first day in wonderful Beeley, we need not search hard for a single word to sum up the trip so far: wet. By some distance, in fact, wetter than many here can remember. However, as is always the case when faced with such inclement weather, us WBJS folk have met the challenge head on. We left promptly this morning, aided by no packing mishaps, and were met by familiar faces at the bottom of the village. We were shown the site and introduced to our instructors for the week, plus the dogs ( oh, the dogs!). Beds were made with surprisingly little help from the teachers and we ate our lunch, whilst excitedly perusing the itinerary for the two days. Out into the rain we all ventured. Mr Simmonds and the Badgers were driven by Colin and his beloved Doris and Molly, to Robin Hood's Stride for an Adventure Walk and Scramble. 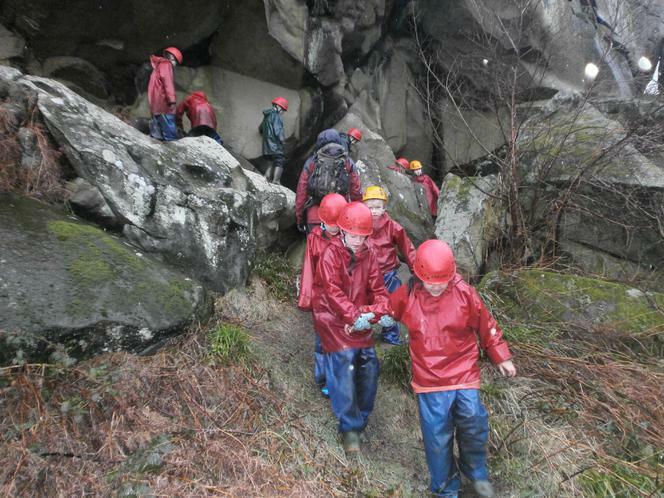 The rain and wind were no deterrent as we plundered through deep puddles and mud, sliding down rocks and scrambling through the tightest of gaps. Matt also had to endure wearing waterproofs far too big for him, Hafsah managed to negotiate an afternoon with the wettest gloves imaginable, whilst Rowan ensured that the two dogs were as safe, if not safer, than the children were. 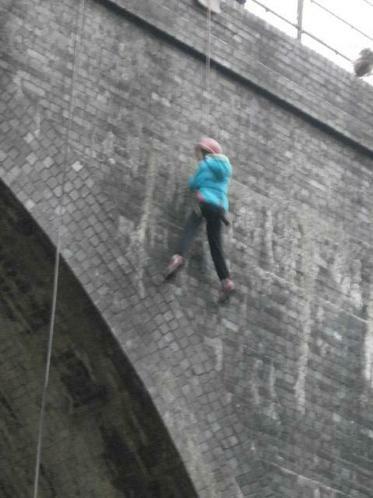 Miss Adams and the Rabbits headed to Miller's Dale, and the notorious abseiling bridge, ably assisted by Clare. Isabella was the first to head down, Jake was brave and fearless as he zoomed down to the bottom whilst Zelda exuded confidence in every aspect of the challenge. 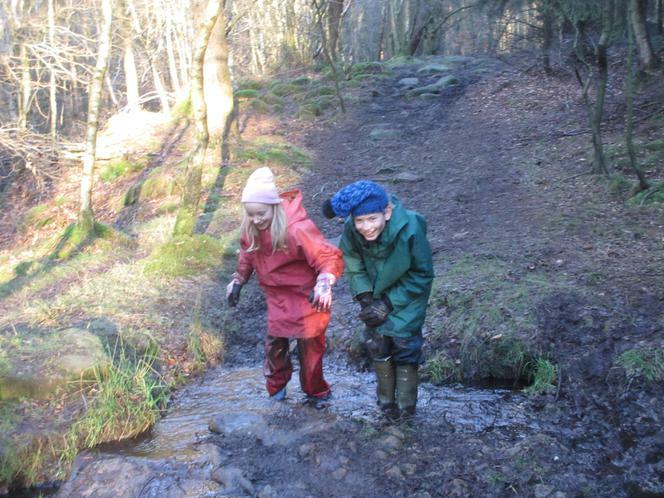 Mrs Cox and Miss Kirk joined Andy for an Adventure walk up into the hills behind Beeley. The mud and water were no obstacle; nor were the strong winds. Jasper won the award for the first Faller, Flora's feet were the wettest, whilst Zak starred in the Getting Boots Stuck stakes. An executive decision was made to temporarily postpone the Night Walk; we'd all had our fill of the outdoors for one day. Thus, once we had enjoyed our first Dukes Barn dinner, and the children performed their first Dorm inspection number, we settled down to an intense Bingo session. Congratulations to Jack, Hatty, Seth and Lucas on their success. Lights out now. Here's hoping for a similar, if drier day tomorrow. Chalk and cheese doesn't cover it. We opened the curtains to the archetypal late winter's day: crisp, cold and clear blue skies. This, followed by a huge breakfast ensured that our spirits were high as we headed out. Badgers headed to the bridge to abseil, minus Doris and Molly sadly. However, the morning was a huge success. Charlie and Peter were not keen, initially, but having seen their friends smiling and laughing on their way down, they put their trust in Colin and gravity and had three goes in all. The afternoon saw them head to Devonshire caves with Miss Adams. Hatty was a delight from start to finish, checking on others less confident than her. Robin proved a good listener and maintained positivity throughout. 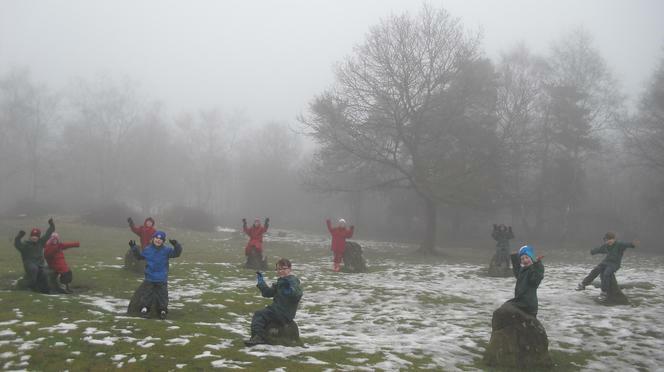 The Owls ventured up the hill on their adventure walk, along with our new arrival, Mr Arnold. Elliot found new ways to end up rolling around in mud whilst Phoebe decided that the only way to face the harsh realities of the Peaks was to adorn herself with rather artily applied War paint. In a nice way, naturally. After lunch, the group stayed on site. 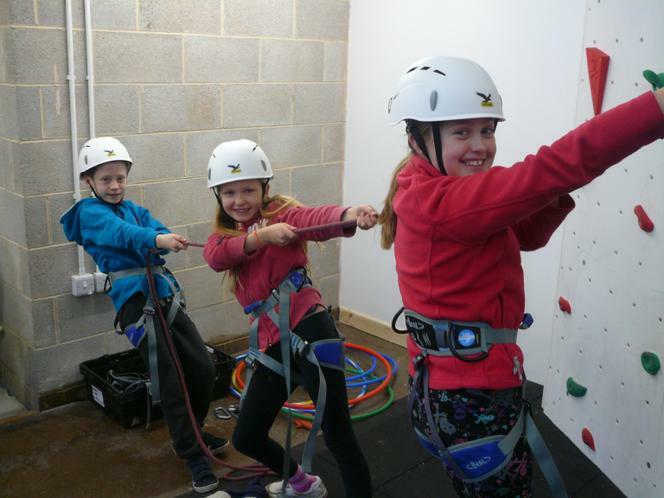 The ropes course allowed Evie to lead the way in both application and encouragement before Edsel and Sophie showed off their climbing skills in the fabulous new climbing centre. Miss Adams and the Rabbits went to Robin Hood's stride in rather more pleasant conditions. Harriet decided to fall through a cattle grid, but not to the detriment of her enjoyment, whilst Millie displayed excellent leadership skills over the tricky terrain. Mr Arnold oversaw their afternoon on the ropes and climbing wall. Kitty and Jack were particularly adept in the climbing activities, combining dexterity and agility. Mrs Cox, Miss Kirk and the Foxes caved this morning. Ellie conquered her fear of the dark whilst Maisie kept an eye out for the group as well as herself. The afternoon saw a trip to the bridge. Saabit, here for the day, enjoyed the task of counting sheep on the journey as much as the abseiling itself. Noah attempted to take selfies on the way down to add to the already rather daunting drop, whilst Xander managed to perform Superman poses on the descent. Shepherd's Pie and cheesecake were on the menu, and enjoyed by all. The weather stayed fine so we took the plunge on a Night Walk. 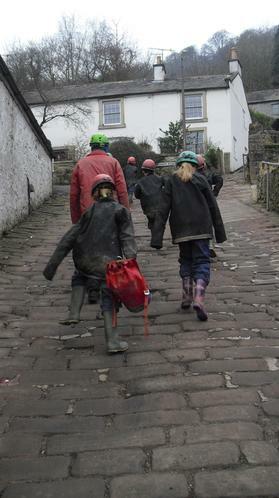 The children were hugely respectful of local residents as we walked up the hill. We all managed to become a 'Friend of the Dark', and torches were an unnecessary item for the walk back. Most of our packing is done and we hope for a good sleep before our final morning. We were greeted by more lovely blue skies as Group 1 began their final morning. We were impressed with how efficiently bags were packed and Full English was the breakfast of choice, as we all appreciated the need for sustenance in order to energise us for the activities. 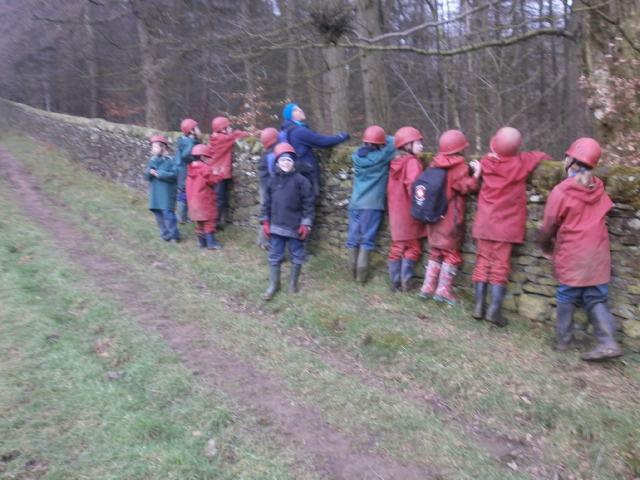 The Badgers remained on site, starting with the Climbing wall. Mae showed great agility and determination when attempting to land the bean bag in the bucket. On the Ropes Course, Connie and Robin were key to the group balancing the see saw. The Foxes were accompanied by Rosa, who supported the group throughout the morning. Amelie shone on the climbing wall, Lily organised the rest on the see saw and Eve took to both activities with the enthusiasm she has carried with her all week. Rabbits went caving first thing. Maisie P was a considerate member of the group, saying the right things to those who needed a kind word. James and Rory were mature into their approach to the challenges the cave always provides, whilst Amelia managed to work her way through an activity she feared, always with a smile. The Owls went abseiling. The group as a whole held no fears, with Reece, Flo and Ruby, in particular, categorical in their belief that they'd saved the best till last. A quick lunch was consumed, and a cursory nod to the new group in passing, before we said our farewells and met Mrs Cresswell, who had the rather onerous role of taking 42 children away from the place they'd very quickly fallen in love with. Onward the rest of us went, welcoming Group 2 and ensuring 39 beds were made before they could eat. 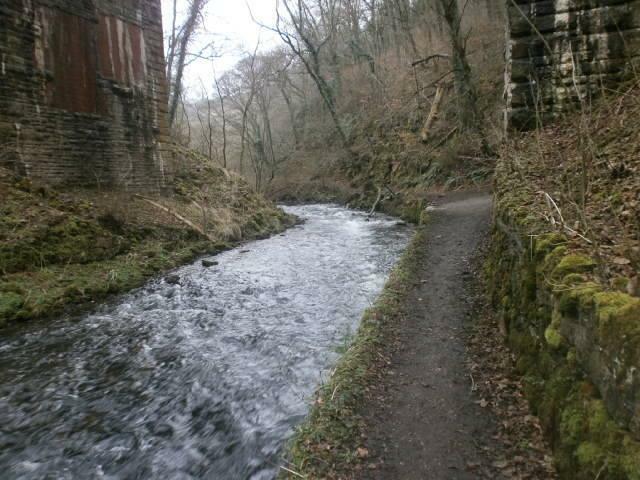 The Badgers, assisted by Mr Arnold, were thrown in at the deep end as they took on the bridge at Miller's Dale. However, they were up to every challenge. Liv stood out, and the blurred photo on this website will confirm this. Finnley could not wait to get through the bars, such a difficult task to many, whilst Lola was a willing volunteer throughout. The Owls went caving. Charlie wasn't keen, but his bravery gene kicked in and he managed to succeed. More than once...Ollie S was particularly helpful to his group, saying the right thing at the right time. Fran decided that the perfect tactic to negotiate the trickiest bits was to fall flat on her face. It worked! The Foxes went walking from the door in glorious sunshine. Elias managed to end up knee-deep in mud, Trixie used crab gymnastics to climb over trees and George M entertained himself by playing impromptu games of Hide and Seek. The Rabbits walked out in the far flung Peaks. Jolyon took on the leader role with aplomb, Hannah G more or less swam her way round, whilst Joe G had to negotiate wearing a mish mash of other people's clothing as well as the tricky scrambling. Archie impressed all on our return by revealing a song he had written for his dorm before he'd even arrived. Jumbo fish fingers were on the menu ( and never has the word Jumbo been so apt ) and heartily devoured. No one was too full to turn down a splendid jam sponge dessert., though. We then wrapped up again for the Friends of the Dark walk under a clear night sky. Bedtime now, and much needed it is too. Another day, another perfect late winter scene. If we'd have been offered this week's weather beforehand, we'd have definitely taken it, despite the rather inauspicious start. Breakfast was, typically, fabulous and we layered up for the day. The Badgers were driven to the top of the hills overlooking the Barn and left to find their way back through the dense woodland. A wonderful time was had by all. Hugo's route of choice was via every water feature, Sam spent half the time emptying his wellies and Molly, reluctant to get her boots wet initially, couldn't resist the waterfall slide. After lunch, we took on the ropes course and climbing wall. Joe B managed to hit the bucket with each of his three bean bags on the harness slide, whilst Libby shone on the ropes. The Rabbits abseiled first thing. 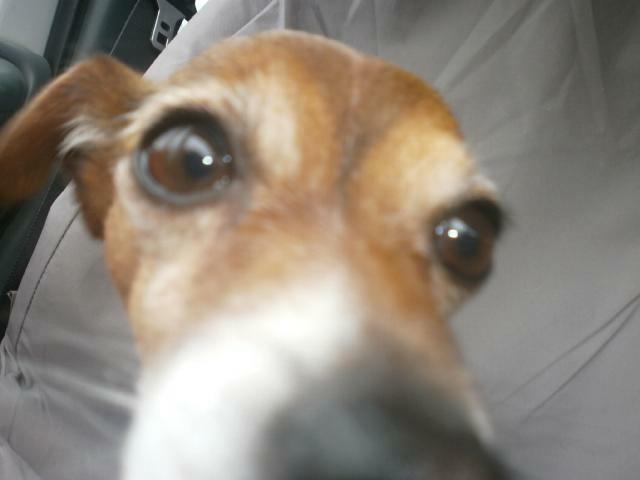 Daisy spent the entire journey and walk petrified, but as is so often the case, loved every minute. Meanwhile, Harry was so confident that he volunteered to be the guinea pig for the group. After lunch, we visited Devonshire caves, accompanied by Mr Ellis and Miss Campbell. 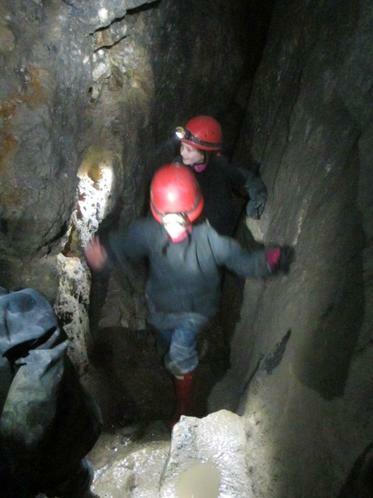 Saffah and Hannah R shone, their confidence increasing tenfold between entering and exiting the cave. The Owls walked this morning out in the sticks. The weather played its part in a fabulous adventure. Poppy and Maisie went on their own mud search, and covered themselves in whatever they could find. Chester felt under the weather initially, but the remarkable restorative powers of hot chocolate worked their magic once more. The afternoon was spent in and around the site. 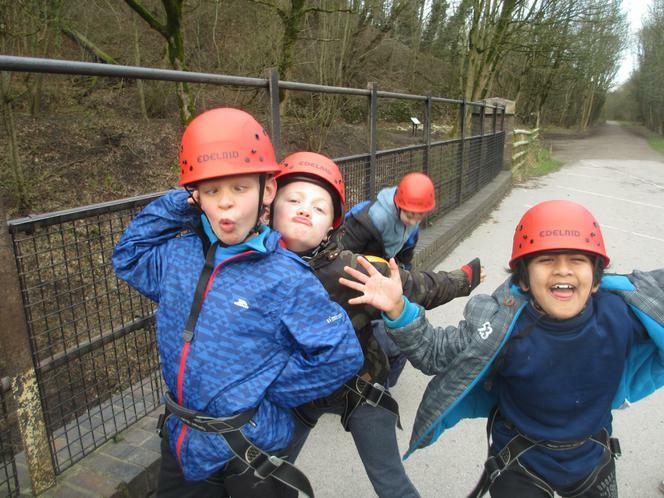 Aayan tried his best to avoid the zip wire, but his group rallied round and the encouragement paid off. 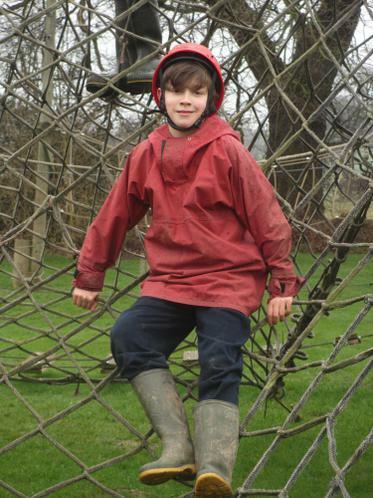 Louis exuded confidence in all aspects of the challenging ropes course, without even a single comedy fall. The Foxes went caving, where Anya defied her nerves and a hand injury, and managed to complete the various tasks. Rajiv was so enthusiastic that he attempted methods and routes rarely seen over the many years visiting Devonshire. The bridge was the next port of call. Ollie B managed three goes after his initial misgivings and became Fox photographer to boot. Esme and Mrs Cox went down in roll as Peppa and Daddy Pig, followed by a detour along Pig Lane as a reward for the former's creativity. Spag Bol and Garlic bread restored our energy, but the Toffee sponge was something else. There were some labouring children and adults as we headed to start packing. Bingo was a success once more. Congrats to Joe G, Frankie, Miss Loscalzo, Mrs Cox, Miss Adams, Libby, Aaron, Archie and Poppy for their nail-biting victories. We are almost ready for home, but have one more morning to enjoy. Here it is: our final morning. Sadly, the rain had returned. but our spirits remained high as we made the most of one last cooked breakfast. Despite the drying room housing rather a lot of personal items, we managed to clear out our rooms in decent time. 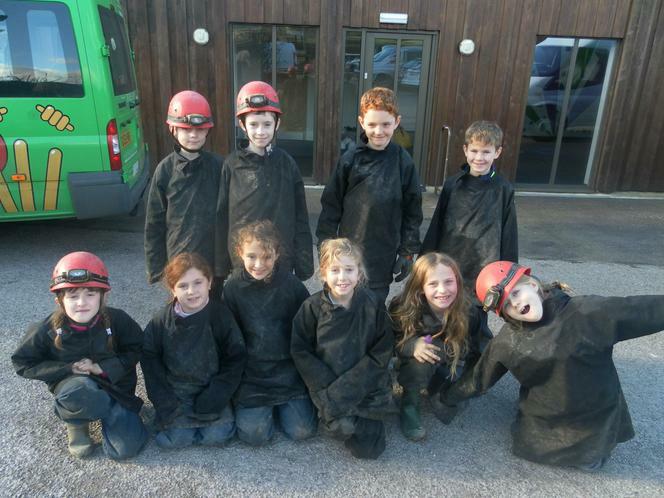 The Badgers were timetabled to visit the caves; not the cleanest activity once cases were packed, but one we thoroughly enjoyed. George was ever anxious to get to the front of the line, whilst Max's knowledge of the local geology was hugely impressive. Miss Loscalzo and Miss Kirk took the Owls abseiling. The hardest task, at the end of the week, was to walk the half mile from the car park. However, on arrival the group proved themselves a daring bunch. Ruby and Aaron stood out, combining fearlessness with rather eccentric commentaries on their descent. Mrs Cox and the Foxes spent the morning in drizzle on the site. Isla impressed with her teamwork on the Ropes Course, whilst Frankie's skill on the climbing wall was unsurpassed. Alongside them were Miss Adams' Rabbits. Jonas was positively monkeyesque on the climbing wall, before Eve displayed calm and thought in her approach to the ropes course. Lunch was a speedy affair, as the bus awaited down the hill. All that was left to do was to show our appreciation for the wonderful staff at Dukes barn, in what has been a challenging few months for them all. Every year we return , we are struck by the warmth of welcome, the quality of provision, the positivity and patience afforded the children. We thank every one of you in helping to make our week here as fabulous as ever, and we are already counting down the days until our return. As always, the first job today was to look out of the window for a weather check. To much relief, a clear, autumnal day welcomed us as we met at Cottages. Allowing for the initial excitement, we made good time organising day groups and spent an hour or so enjoying the outdoors. However, as anyone who has seen it will testify, there’s only so long one can delay a screening of Shaun the Sheep: the Movie. Naturally, this was enjoyed by all, the adults in particular, before we ate our lunch and prepared for departure. The journey was swift and we arrived at 2:30, where we were greeted by our ‘Groupies’ for the week, Darcie and Dan. We were taken to our dorms and spent some time acclimatising, before a thorough tour of the site. Being the first school in for dinner was a pleasant novelty and the overall verdict was encouraging. Lincolnshire sausages should be rather good in these parts, it could rightly be argued, but they certainly got the thumbs up. Our wishes were granted. If anything, today’s weather has been even better. The children have settled so well, recognising the need for decent sleep in readiness for the relentless days. We’ve been granted a later breakfast slot, allowing for a slightly longer lie-in. Once we’d eaten, our activity timetable could begin. 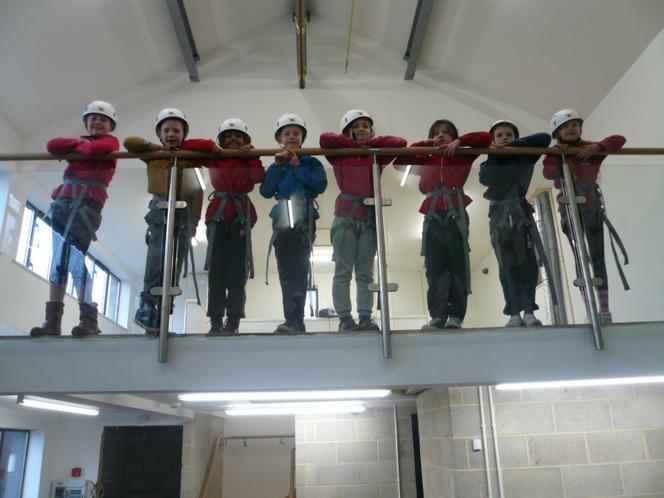 Group 1, accompanied by Mrs Brown, began with abseiling. Max managed to reach the 9th rung, a rare achievement. Noah B had three attempts, each one resulting in a confidence boost which transformed his experience to a wholly positive one. The group then enjoyed Aeroball before lunch, during which Clara displayed much energy and skill. Jacob’s Ladder and Problem Solving were enjoyed in the afternoon as the children relished the pleasant weather and proved themselves to be a thoughtful and supportive bunch. Mr Simmonds and Group 2 began with Aeroball; an active start. 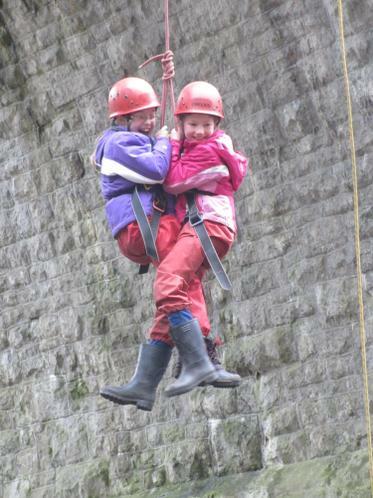 They then moved on to their first harness activity: abseiling. The group performed creditably, with Michael’s efforts particularly impressive. 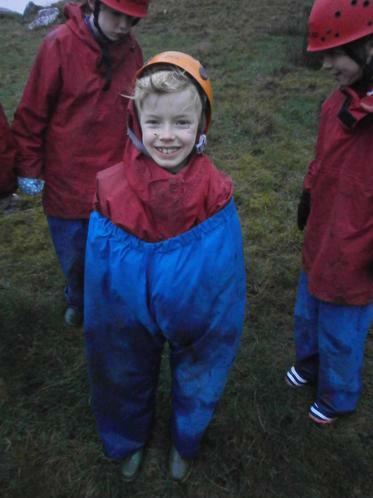 The thought of the task was not a pleasant one, but he gritted his teeth and went for it in the traditional PGL manner. After lunch, Problem Solving got our brains working, before we finished with Jacob’s Ladder. The whole group impressed, but special mention to Edith for her monkey impression on the 9th rung. The group are also indebted to Ben D, whose prowess with harnesses ensured that we maximised our time. He has a job for the week. Miss McQueenie accompanied Group 3 as they began with abseiling. Sadie appeared to be wishing she could be anywhere else but here initially. However, through tears, she managed to respond to her group’s encouragement and reached the bottom, those tears soon replaced by a beaming smile. Aeroball followed before lunch, with a number of close matches taking place, before Jacob’s Ladder provided the group with a number of challenges. Maddie displayed fabulous teamwork skills, leading by example and helping others, whilst Noah Mc fought his emotions and reached his original target. Problem solving was a calming end to a successful first day. Miss Ash took Group 4 to Aeroball for an energetic beginning. 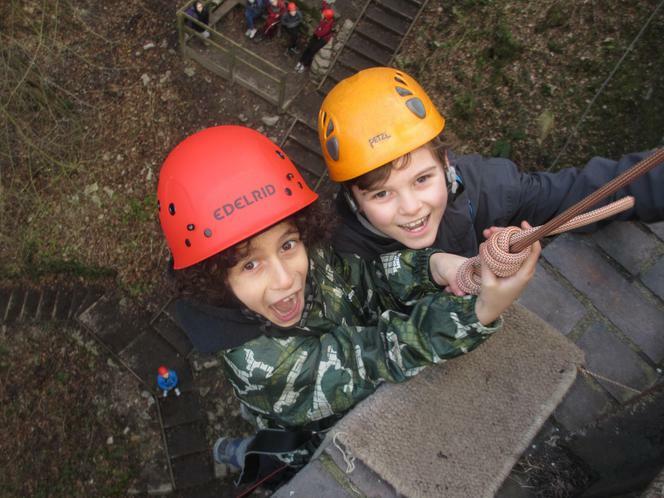 Then it was on to Abseiling, where Leon produced the first ‘big moment’ of the week, memorably descending with Miss Ash’s help, despite his initial horror. Once lunch had been enjoyed, the group enjoyed a variety of problem solving tasks, ending the day with Jacob’s Ladder. Esther was both confident and encouraging, whilst Louis and Sachin were a real partnership, helping each other climb as high as they could. Group 5, alongside Mr Martin and Miss Rimington, began with Archery, Jack Mc revealing himself to be a master marksman. Problem solving followed up to lunchtime, then the group headed to the Rifle range. Millie P performed particularly well. Finally, the Trapeze lay in wait. The group were fabulous to a child, but special mention must go to Elliot O, who persevered despite stepping considerably beyond his comfort zone. Mrs Green and Group 6 began relatively sedately at the Problem Solving zone. Finn H impressed with his ability to think outside the box. This was followed by Archery, during which Ellie W displayed ace marksmanship. The trapeze followed lunch and Ollie D made the group proud with his approach and skill on a very tricky activity. The day was completed with Rifle shooting, Holly both impressing and scaring everyone with her fabulous aim. Mrs Moss and her Group 7 began at the Rifle Range. Anjali proved herself to possess a steady hand, scoring highly on the target round. The Trapeze followed, by some distance the most daunting task of the day. Tom T led the way by grabbing the beam after a Leap of faith, whilst Christian bravely reached the platform at the top of the ridiculously high, worryingly wobbly climb. Orienteering began the afternoon, with the group enjoying the weather as they followed the map around the site. Finally, we became the first group to ever negotiate the new Tunnel trail, with Amelia proving herself to be the best ‘mole’ we’ve seen. Dinner was enjoyable and everyone then showered and prepared for the disco. For three of us, however, the evening took an unexpected turn. Isaac B had an unfortunate accident and cut his foot severely. Mrs Moss and Mr Simmonds accompanied him for a long night at Grantham hospital. Fortunately, we’re pleased to report that he is now back with us and should not be too inconvenienced over the week. Everyone else made the most of the chance to let their hair down and the centre is now quiet as we catch some much needed sleep. It couldn’t last. As we met for breakfast, we were reminded why we have brought so many items of clothing. The clouds were thick and grey, the rain heavy and persistent. In addition, Phoebe S had fallen ill overnight and was picked up by Mum. Nevertheless, spirits were not dampened and we headed to the dining room with a busy day ahead. 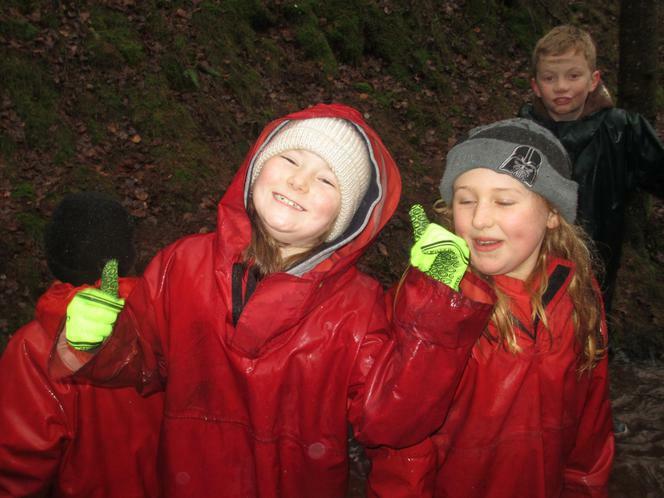 Group 1 began with Tunnel Trail, one activity certainly affected by the weather: they were almost waterlogged! If anything, though, this made for even greater entertainment. The Rifle Range then provided shelter before a chance to change prior to lunch. The afternoon began with the Zip Wire, on which Eva and George not only zoomed down with confidence, but also found the nerve to imitate a variety of Superheroes. Sensory Trail completed the day, Ben P impressing with his clear instructions from the front, a crucial skill when blindfolded and faced with obstacles of all kinds. Group 2 got lucky: the Rifle Range was the perfect place to be during the worst of the weather. Martha was chuffed to score well on the target game, despite lacking confidence initially. As the rain eased, we then took on the Tunnel Trail, which provided much mirth and a great need for a change of clothes. After lunch, we hit the Sensory Trail. Summer made sure we negotiated much of the trail with no mishaps, so clear were her instructions. We finished with Zip Wire, Aidan and Anna proving particularly adept at ignoring the obvious downsides to such a concept. Mr Arnold returned to join Group 3. They began in the tunnel trail, regretting their immediate thoughts that it would be the safest place to hide from the rain. The Challenge Course followed, Henry and his customary enthusiasm particularly pleasing. Post-lunch, the Zip Wire was a chance for Isaac to prove that his injury was not too debilitating, before the Archery zone was visited, in which Lauren B displayed considerable style and Zoe took immense satisfaction from firing the winning arrow for her team. Group 4 began on the rather exposed Challenge Course, with wind adding to the rain for good measure. The Tunnel Trail allowed many a chance for folk to get as wet as humanly possible. Once lunch had reinvigorated the group, we headed to Archery, where Jack B and Fintan shone with their skills. Finally, everyone flew along the Zip Wire, with Annie’s confidence to the fore. Maria, conversely, could barely even imagine hanging off the wire, but eventually went for it and loved every moment. Group 5 began running through every puddle available as they took on the Orienteering course, with Sam F shining as he has done with everything to date. Jacob’s Ladder followed, at which point Katie made everyone proud with her sterling efforts and perseverance. Aeroball was the scene of many a close encounter and Samuel S took on the challenge of Tunnel Trail with quiet determination, as he has in every activity this week. Group 6 began with Jacob’s Ladder, with the early start not deterring anyone. Lily got stuck at one point, but her determination got her through; Tilly whizzed up there and enjoyed the chance to ‘hang around’ for a while; Grace’s teamwork skills came to the fore; Michael Bradley approached the whole experience in his methodical, fuss-free way. Orienteering followed, before the slightly drier Tunnel Trail and Aeroball took place in far more pleasant conditions. Group 7 ensured that Mrs Moss enjoyed her final day immensely. Sandy’s climbing skills on were akin to a monkey, whilst the group were helped by Benji’s super confident belaying. Problem Solving was another chance for Juliet to keep up morale with her consistently sunny smile. The Zip Wire was a lovely hour and a half, as the weather transformed from grotty to pleasant, and Aeroball had Sam C still going for it, despite the long day and his wet socks. A better start weather-wise and Phoebe’s return meant a very positive beginning to our final full day. Breakfast was plentiful and we were all set. Before we began, we said farewell and Bon Voyage to James S and Summer, who were heading to Portugal for the week, and hello to Zack, who has joined us for the last stretch. Group 1 began with Climbing, at which Finlay Be, Sancho and Elissa performed admirably and with great speed. We then headed to the Challenge Course where Alistair and Lucy W proved themselves to be nimble and agile across a range of obstacles. There was a very diplomatic approach to the orienteering task and Lauren W hit the bullseye the most times down at the Archery zone. Group 2 began with the Challenge Course, facing the strong winds as well as the obstacle course. Isaac was in his element, finding all manner of ways of climbing apparatus. We then climbed more traditionally, the perfect start to Zack’s time here. He hit a wall, literally and figuratively, three quarters of the way up, but managed to push himself to the top, where his ringing of the bell was met with applause from everyone in the vicinity, some of whom were from other schools. After lunch, we became archers and Jordan, our instructor, was hugely impressed. Charlie B stood out, not only for his skill, but also his encouragement. Phoebe ensured that her team scored highly in the Pizza and target games. We finished with Orienteering as an energetic, less scary end to the day, with Noah A giving it his all, as he has done in every session, whilst remembering the Group 2 rule to clap whenever a member of the team returns to terra firma. Group 3 had a fabulous day, impressing Mr Arnold with their skills and enthusiasm. After they’d escaped Fencing unharmed, they fired rifles, with Jared and Sam B standing out as prolific. The adrenaline rush of the Trapeze came next, where Archie and Elliot H flew through the air with confidence and grace, before Jess led her team brilliantly around the Orienteering course. Group 4 began down at the firing range, where Jake hit the bullseye three times, previously unheard of. They then fenced, a chance to prove their earlier aim had not diminished. After lunch, it was time to orienteer around the site in pleasant sunshine, before a high-intensity ending on the Trapeze. As a group, the collective emotion was of nervousness. 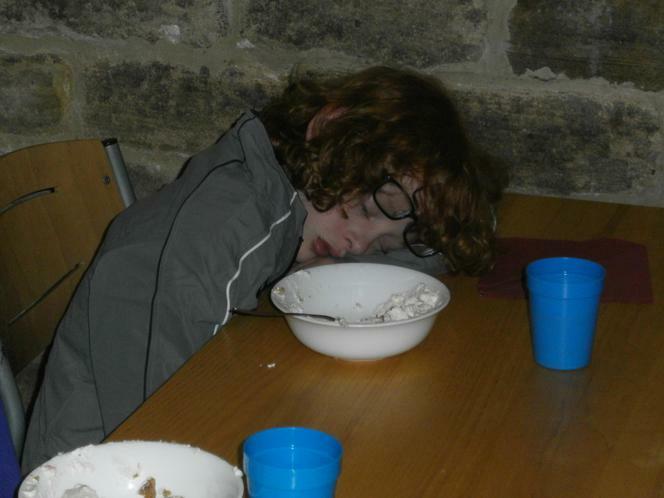 However, Tom S took matters into his own hands by whizzing up, setting a bar which was reached by the rest of the group. Phoebe S and Poppy were particularly relieved, and delighted, to grab the bar. Group 5 headed to the Zip Wire for the perfect breakfast-settling activity! Niya particularly enjoyed the experience, laughing and screaming her way all the way along. The Challenge course followed, where Sam S, a PGL regular, used all his experience to assist and cajole his team, as well as perform to a high standard himself. Lunch preceded the Abseiling wall, on which Gemma decided once wasn’t enough, but three times was. The Sensory Trail completed the itinerary and highly successful it was too, thanks, in no small part, to Millie T and her excellent communication skills. Group 6 began alongside Group 2 on the Challenge Course. The whole team, looking somewhat weary on arrival, soon returned to their old selves. The Zip Wire was the scene of one of the performances of the week, with Joshua whizzing down to his own rendition of the Mission Impossible theme tune. The Sensory Trail was navigated with no bumps and bruises, as Finlay C led the team bravely through ‘snakes and spiders’, followed by the Abseiling wall, a triumph for Finlay B and Cleo, who sang and bounced their way down serenely. Group 7, now joined by Miss Chapman, fenced to begin with. Sasha is now known as a potential threat should she have a foil in hand. The abseiling wall was almost too easy to the group, all descending confidently and swiftly. In the archery zone, Ben L’s attitude was an example to all, listening and encouraging at all times. Jacob’s Ladder, a big end to the day, saw Joseph fulfil his goal after a monumental effort. To our disbelief, we have spent some of our dorm time packing, having visited the shop. We now have ambush, essentially Hide and Seek to the power of 10. The children are looking significantly weary and we anticipate a very sound night. Here ends yet another fabulous day. Rabbits – Thea, Jessica, Lily, Beth, Hamish, Will, Tom, Aaron, Mo, Samuel and Mrs Cox. The journey was as smooth as could be expected and we were met at the bottom of the hill by the familiar faces of Colin and Colum. We walked up the hill – a challenge to some – to our first glimpse of the ‘Barn’. Once inside, we were shown around before the annual Fabric Fight, otherwise known as bed-making. With one or two unnamed exceptions, the group performed pretty well, no doubt spurred on by the incentive of lunch. Mr Simmonds and the Foxes walked from the door, up the incline now known as Sledging Hill (not this year, sadly), through the farm and up towards the woods. Last week’s two feet of snow had left an indelible mark, namely waterlogging of paths allowing numerous opportunities for children to lose wellies. 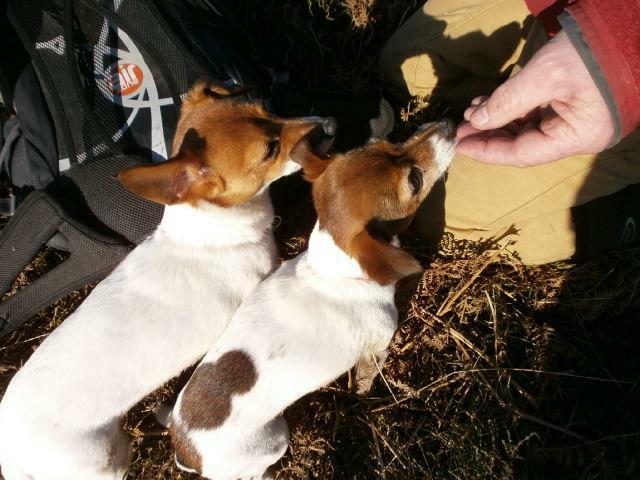 As ever with Colin as our guide, we had the immense pleasure of the company of his two tiny dogs, Doris and Molly. The route down through the woods could only be described as unconventional, with many a slippery slope or steep climb thrown in. Great fun all round. The Owls went off to Mildridge Cave with Aidan. There were plenty of opportunities to slip and slide on the walk down, along with a little remaining snow. 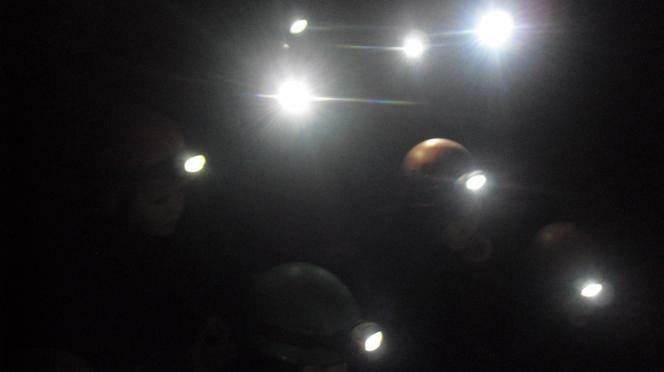 The caves presented their own challenges, met head on by the entire group. Much information was gleaned, and the emergency tunnel was negotiated. Thankfully, the number count on the return journey matched that on the way. The Rabbits were treated to a scenic drive through the Chatsworth Estate, with views of the famous deer, on their way to the famous (infamous) abseiling bridge. Once there, we trudged the half mile from the car park, carrying the tubs of safety equipment, a challenge almost the equal of the abseil itself. The confident children suddenly found their confidence dissipate on peering over the edge. However, the whole group managed to descend three times by the time the session ended. This evening saw our first chance to see if the food lived up to its legendary status. Judging by the empty plates and happy faces, it’s fair to say it did and then some. We donned our waterproofs again in readiness for the Night Walk. The children became Friends of the Dark, though not necessarily Friends of the Village, such was the volume of excitable chatter! We awoke early to a grey, but dry day. 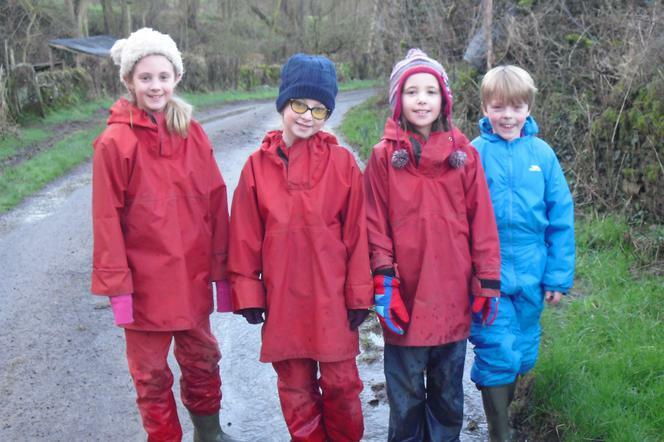 The group were fed with the Barn’s customary huge breakfast – the bacon was particularly well regarded- and we layered up for morning activities. 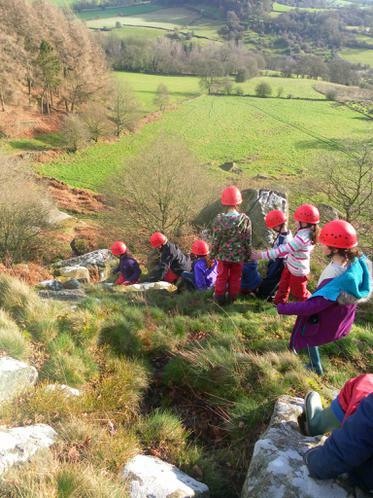 The Badgers visited the Dale for abseiling. Some children were so wary that they held back, almost as far as the other side of the bridge. However, there was a 100% success rate, despite a variety of unconventional techniques. 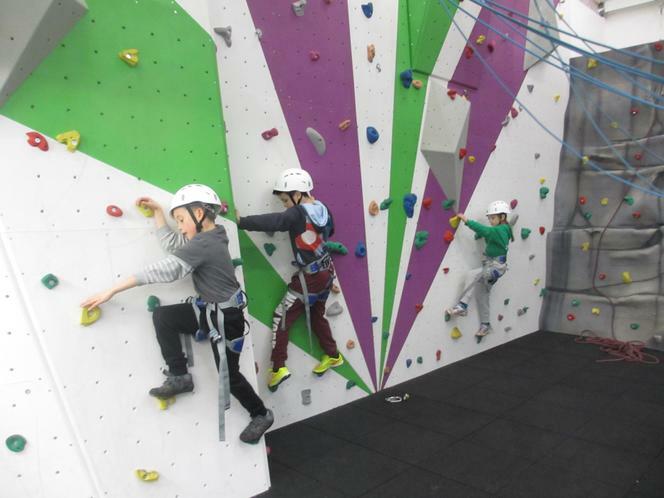 The Owls remained on site, being the first to experience the fully completed climbing wall. 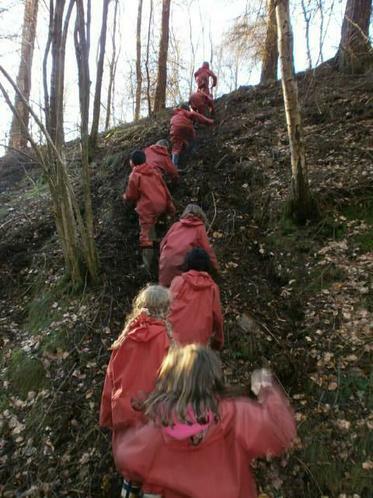 Miss Rimington was hugely impressed with their ability in completing a wide range of ever more challenging tasks. The Rabbits had a lovely, calm drive to Stanton Moor. The countryside continued to look wonderful, despite the low-lying fog. The group managed what the Badgers couldn’t quite, saving the Tenth Lady, having used their little grey cells in solving the clues. Lunch took no time at all and we were soon running around trying to find the outer layers we’d worn not one hour previously. The Badgers checked on whether the Foxes had left Devonshire Cave in full working order. A few tears were shed prior to climbing in, and once the deepest recesses had been reached, and a number of testing routes were chosen by Graham, the Barn manager. 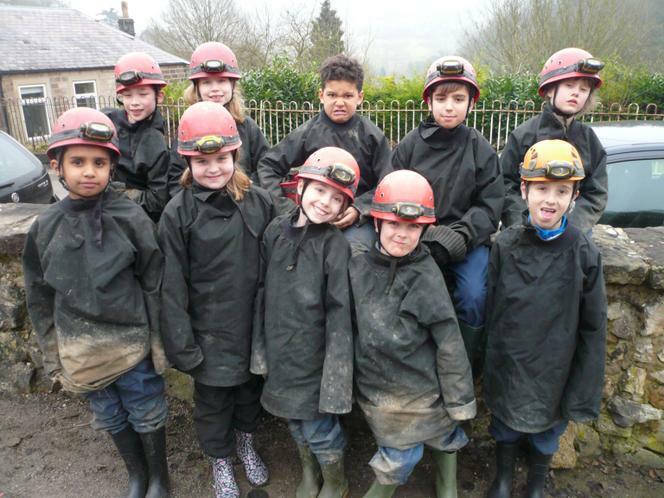 However, with encouragement, the entire group managed to leave the mine behind with proud memories. Foxes went abseiling. As the afternoon temperature dropped, the excitement rose as, one by one, children flew down at increasing speeds, putting many teenagers in other school groups to shame with their fearless approach. Once again, Doris and Molly were very welcome company throughout. The Owls walked, scrambled, jumped and almost swam around the woods. The weather presented an additional challenge, as the sun refused to appear at any point. Nevertheless, the group had a whale of a time, with not a single whinge or gripe over the two-mile route. The Rabbits stayed on the site and enjoyed the Climbing Wall and the Rope Course. They all managed to get to the top of the blue wall, regarded as the greatest challenge of the lot. The Ropes were almost more preferable to the ground, which was sodden. The occasional calamity notwithstanding, the course was negotiated with great confidence. A huge plate of Spaghetti Bolognese was sufficient reward for the day’s efforts, followed by a rather splendid Jam Sponge. The shop was then visited before the highlight of the week: Bingo time! The staff were disappointed not to win, despite attempts to bribe the Caller. It was a fitting end to a fabulous day. Remarkably, tomorrow sees an end to Group 1’s adventure. Before we go, however, more challenges await. A similar day to Tuesday awaited us as we rose this morning, slightly earlier with the packing escapade in mind. Rather impressively, the dorms were all empty by breakfast time and we could concentrate on food and adventure. The Badgers and the Foxes stayed on site, enjoying the Ropes course and new Climbing Room alternately. Both Mr Arnold and Mr Simmonds noticed an increasing confidence and awareness throughout the morning, with the children applying skills gained over the previous two days. To summarise, no major incidents were reported, affording the children maximum time to enjoy the activities. The Owls went abseiling. Everyone was in fine spirits and coped fabulously with a task that many of us adults would baulk at. Again, many older students could do nothing but watch in awe. The Rabbits headed to Devonshire. After the steep climb just to arrive, the group enjoyed the whole experience. They pretended to be Victorians as they climbed the stairs, many of them looking rather regal. As always, Crossover Day provided one or two obstacles, but the two groups passed each other like ships in the night. Mr Arnold escorted Group 1 home, alongside Miss McQueenie and Ms Stephenson. 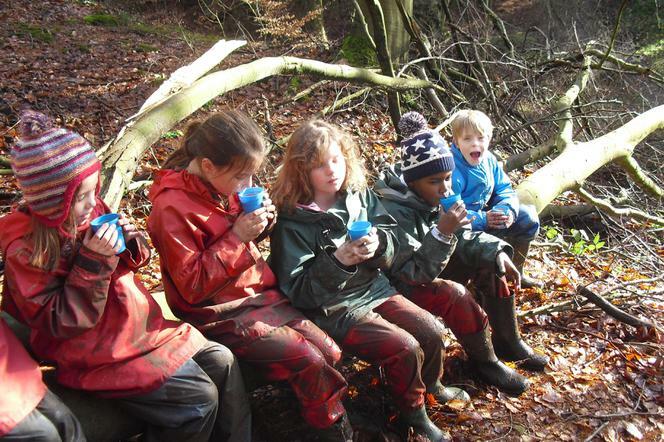 We trust the children had a wonderful time and look forward to seeing them fleetingly on Friday afternoon. 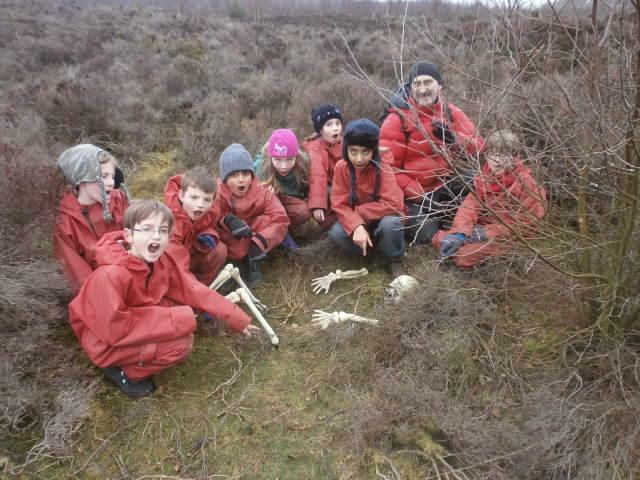 Badgers- Mila, Bani, Iona, Owen, Harrison, Oliver B, Zeeshan, Rowan and Mr Simmonds. Foxes – Georgia, Lucy, Kate, Ruby, Danny, Sulayman, Leo, Ben, Sam B and Miss Rimington. Owls – Skye, Bronwyn, Izzy, Riya, Sam T, Ewan, Jake, Finn, Dealan and Miss Loscalzo. Rabbits – Bettie, Ellie, Nina, Reuben, Charlie, Oliver W, Vince, Billy and Mrs Cox. The new Badgers headed to Devonshire cave. 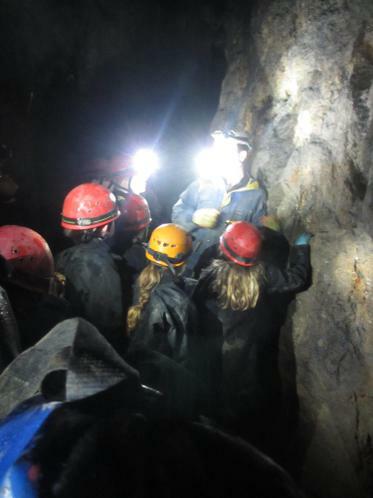 They impressed with their listening and knowledge, and even managed to avoid the temptation of switching their headlamps on during the ‘dark’ challenges. The Foxes went abseiling. It cannot be overstated just how high the drop is from the bridge in Miller’s Dale, yet once again, with little encouragement, the group excelled themselves. 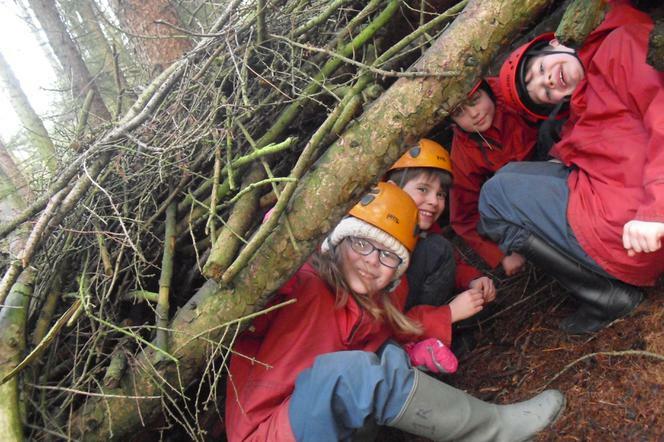 The Owls built a den during their adventure walk, spotted numerous wildlife and their poo (just telling it how it is), and waded through the stream which was still very much in spate. The Rabbits attempted the Climbing Wall and the Rope Course. 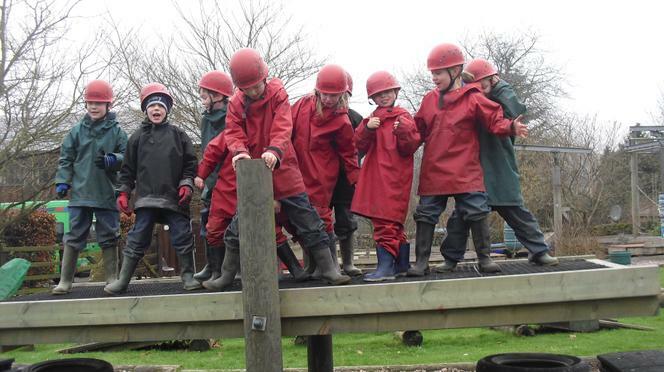 Excellent teamwork resulted in their being able to balance the Mega See Saw, whilst they particularly thrived on the new Zip Wire, some making indescribable noises as they swung over the rest. The Night Walk enabled us to truly enjoy the peace and tranquillity of this wonderful part of the world. We all became Friends with the Dark, before the clock told us it was time for bed. What lies in store on Day 4, we wonder? A 7.30 start was a rare luxury this morning. A good night’s sleep was had by all and the mood was buoyant at the breakfast table. An unprecedented number of Full English breakfasts had been ordered; it’s always a joy for the teachers to see the children eating well. Graham lulled us by insisting that the temperature was slightly higher than yesterday, a point of view not held by the majority. However, we weren’t going to let a little Derbyshire chill prevent us from a day of adventure. 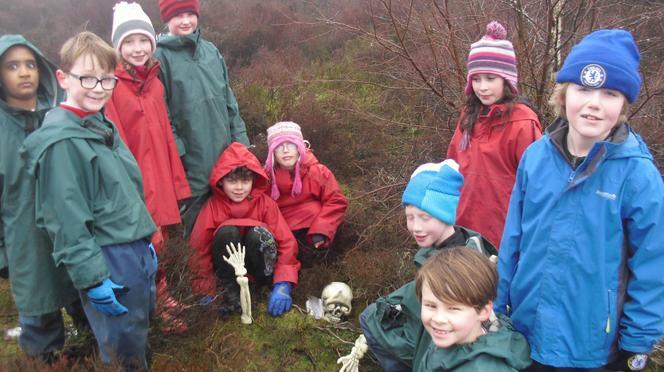 The Badgers were the next group to experience the new Stanton Moor mystery walk. 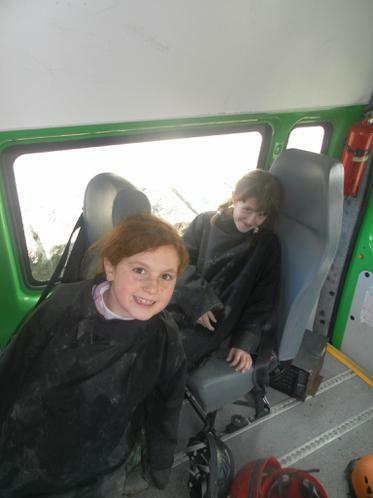 All wrapped up, they accompanied Colum and Mr Simmonds in the minibus, before following the clues provided. 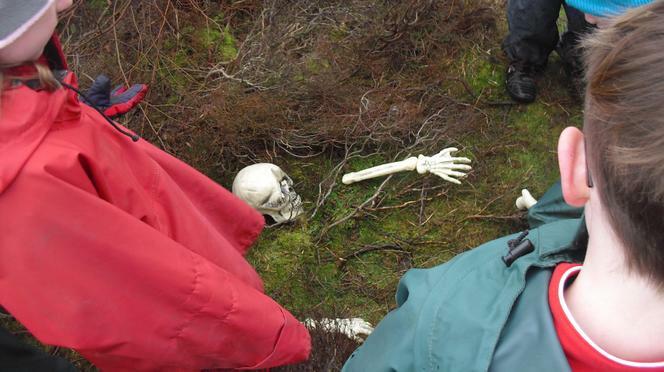 Finding the skeleton at the end was just reward for their endeavours. Colum was rather impressed. The Foxes spent the morning on the ropes and in the climbing wall. Many proved that they were experienced in such activities, but enjoyed the team games and individual challenges nonetheless. The Owls returned to Devonshire, this time with special guest Miss Gillet. They worked together to complete the challenges set, having overcome the odd wobble to begin with. The Rabbits were joined by Miss Kerry and Oliver G, our very special guest for the day. They were next to face the Millers Dale abseil. It would be fair to say that the whole experience met with mixed emotions, yet, once again, WBJS children stole the show. Lunch was much needed by all, and the Mars Bar Chocolate Crisp Cake was, without fear of hyperbole, THE nicest thing on the planet. We were soon re-energised and ready for the afternoon. The Badgers spent much of the afternoon in the Climbing Room. Many different games were played and enjoyed, with Mr Arnold making a welcome return. The zip wire bean bag game proved to be a fabulous end, before a quick circuit of the ropes course. 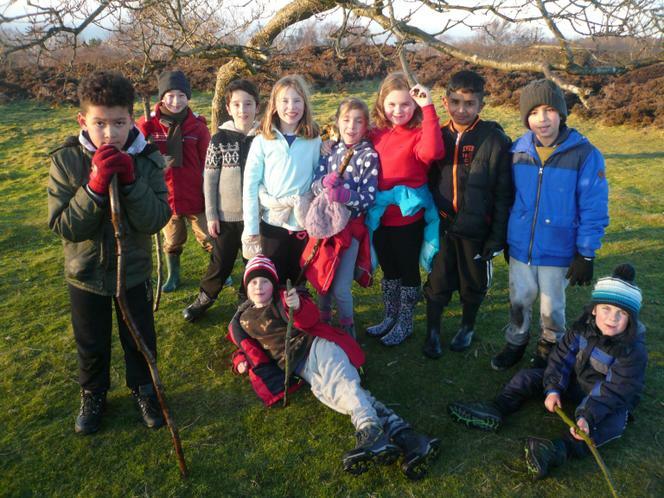 The Foxes walked around Stanton Moor. The temperature was decreasingly rapidly, spurring the group on to solving the mystery in record time. The witches and skeletons failed miserably in their attempts to distract them. The Rabbits went to Devonshire cave. They listened intently to the eerie story of Jack and his dad, adding to the sense of mystery underground. 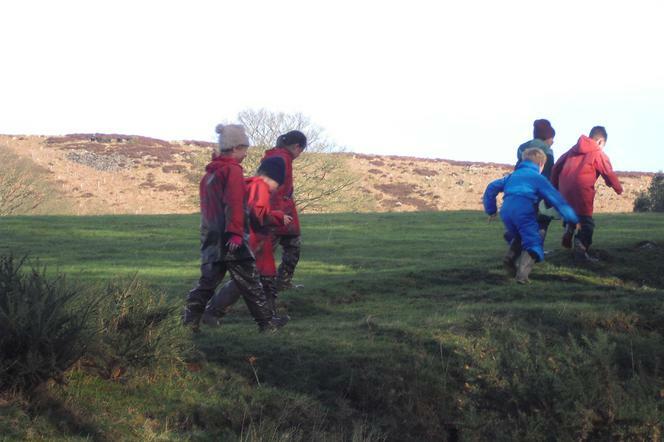 Every child selected the challenging route, allowing for numerous scrambles and jumps. Mrs Cox wasn’t too keen, but couldn’t let the others down. It’s early morning and we’re calmly (?) getting our things packed for the return home. The children slept as well as expected and we are eagerly anticipating breakfast and our final activity. The Badgers will be the final group to risk the bridge, Foxes are heading to one of the caves, Owls will attempt climbing and ropes and last, but not least, Rabbits will brave the cold up on the moors. Following a quick sandwich – and homemade shortbread – we are hopeful of a 1.30 departure and an end to a typically fabulous week. As is always the case, we are hugely grateful to so many people: Graham, Heather, Colin, Colum, Aidan, Matt, Jo, Debbie and Tom here at the centre for all their hard work and support, our teachers and, above all, the children, who are a credit to you all. It’s 9.30 and we’re all safely in bed. The temperature has dropped and we’re battening down the hatches in preparation for the forecast hurricane! The first day has gone pretty smoothly, with only the odd unexpected event. We managed to spend the majority of the morning on the field at cottages, having sorted out dorms and day groups. 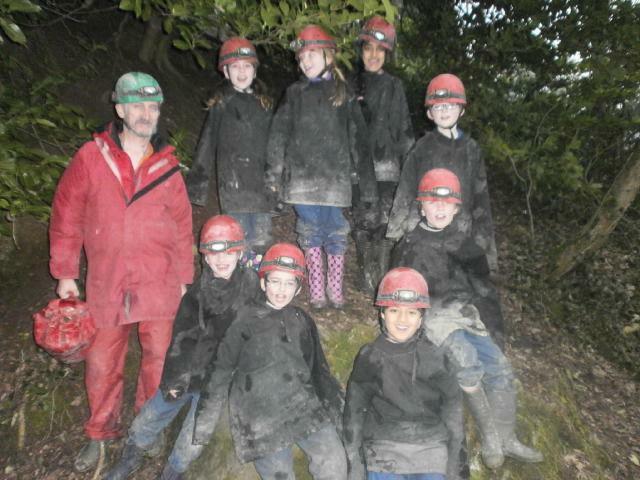 Some folks had managed to cover themselves in mud before we even left school! After lunch, we headed to the coaches accompanied by a number of parents. Once the farewells were complete, we enjoyed a very smooth journey to Caythorpe Court. Our groupies, Sam and Matt, took us to our dorms where we enjoyed a short time to unpack. A tour of the site followed before a first, very early, evening meal. Chicken Tikka Masala, Lincolnshire sausages or a Vegetable and Feta pasty were the rather tasty options. The evening activity was Wacky Races, where the children dressed up in all sorts of ways and were challenged to complete a variety of events. Many of them were half-ready when the fire alarm went off (the fault of a child from another school, we hasten to add!). We now hope for an uninterrupted night’s rest before the ante is very much upped tomorrow. How is it that whenever the forecasters predict pleasant weather, they’re wrong, yet they always get it bang on when it’s meant to be vile? We’ve seen it all today. Heavy rain fell through the night, the wind was vicious first thing and over breakfast, well, the storm could only be described as biblical. Such contrasts remained with us for much of the rest of the day, but we were rather fortunate in that none of the rope sessions were cancelled and we all remained relatively dry. Miss McQueenie and Group 1 faced the dreaded High Ropes to begin with. Callum was a bag of nerves, yet was determined to complete the course, then did it all over again. Gabby, having only arrived first thing after illness, whizzed round the Quad Bike course, before Alex L impressed with her courage on the abseiling wall. Problem Solving completed an enjoyable first day of activities. Group 2 and Mrs Green started on the Quad Bikes, enjoying the activity despite the bitter wind. 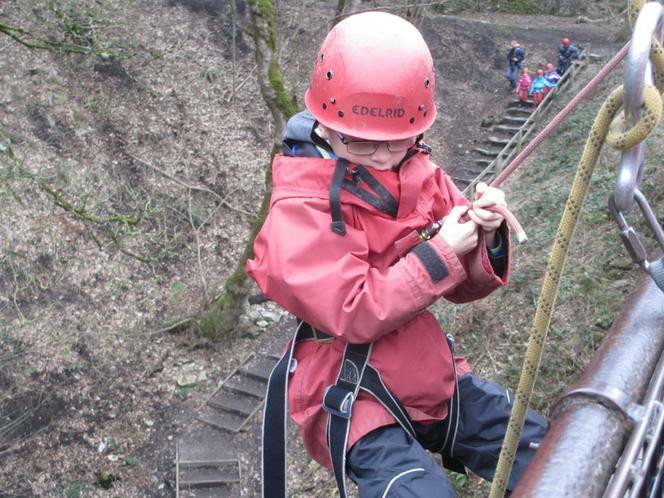 The High Ropes provided a very different challenge, one which Mason showed remarkable bravery. Indeed, his journey has already gone down in PGL history, such was the range of emotions he experienced. Imogen made her way around half the course, was adamant she wanted to return to the start, but Ida came to the rescue in helping her to reach the end. Poppy, also, belied her fear in completing the challenge, which was added to by the vile conditions. Problem Solving was Saibha’s turn to impress, her sound reasoning assisting the group through a variety of puzzles. Mrs Moss and Group 3 began with abseiling, where all the group impressed. Hannah Dobson proved herself a very talented driver of a Quad Bike. Lunch followed, before Amber’s confidence and enjoyment of the infamous High Ropes astounded Mrs M. Bradley kept everyone entertained as he moved around the course with a variety of techniques, not all from the text book! During Problem Solving, Blythe displayed a very diplomatic approach to the tasks. Group 4’s first full has been a triumph from beginning to end. We started with Quad Bikes and Thomas Wesley wasn’t shy about demonstrating his skills on the track; the instructors were quite impressed. The success continued with abseiling, where Riaz showed a great deal of courage in his first ever attempt at the vertical walk. 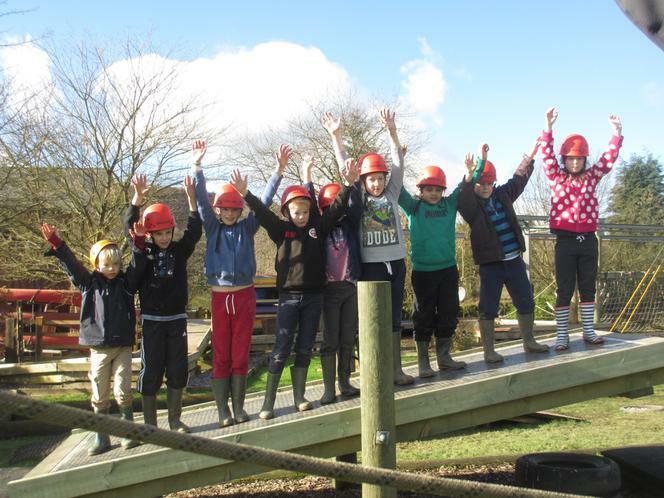 The entire group shone during High Ropes – they could have given nothing more. Elizabeth, showing grit beyond her years, pushed through her tears to complete all of the challenges. Group 5 were also greeted by the High Ropes to start their day. Vinnie froze on the wire, panic stricken, whilst the instructor was assisting elsewhere. Enter Tom and Sean to save the day. Miss Rimington was so proud of how they stood either side of Vinnie, slowly but surely ushering him safely home. The whole group enjoyed Quad Bikes before lunch, followed by abseiling. Eloise stood out, zooming down without a care in the world. Problem Solving was a suitably calm end to the day. Group 6 and Mr Simmonds began the day with Quad Bikes. After a palaver with one of the machines, everyone proved to be rather efficient. Evie took to it with particular aplomb. The group moved on to the mighty High Ropes. Charlie J led us off and negotiated the many horrifying obstacles without a murmur. After lunch, Problem Solving required some brainwork before we finished with abseiling. Jasmine Smith found the initial climb through the fence terrifying. The group soon cottoned on to her dilemma and roared her on to terra firma, her smile writ large. Scavenger Hunt was the hugely enjoyable evening activity, an ideal way to complete our first full day. PGL is now shrouded in darkness and it’s time for sleep. We awoke to what we’d call ‘proper’ PGL weather: blue skies and cold. We met our instructors for our second day of activities and off we went. Group 1 began with All Aboard, where groups of three help each other up a pole with five decreasingly-sized platforms. Hari V and Miss McQueenie were a very well-matched pair, reaching the top in rapid time. Eleanor impressed with her Fencing skills before lunch. Climbing rewarded Ruby for her fabulous teamwork and agility, as did the group in general, whilst the Sensory Trail provided opportunities for the children to use their communication skills to navigate round a course blindfolded! Group 2 and Mrs Green began with Fencing, enjoyed by all. Finn impressed all on All Aboard, climbing skilfully and assisting his group. The Sensory Trail saw Romy terrified, in contrast to previous, higher challenges, yet was supported warmly by her teammates. Climbing was the final activity, during which Amelie received plaudits from everyone for having a real go, despite her misgivings. Meanwhile, Ida rang the bell at the top with the minimum of fuss. Group 3 started on the Climbing wall, with Harley and Alex displaying determination and prowess even at that time in the morning. The Fencing allowed for some serious duals, all within the warmer environment of the Sports Hall. Matthew not only succeeded on All Aboard, but was the most adept in the crucial bilet role, and special mention must go to Lily for her endless positivity and humour, entertaining the group throughout the day. Group 4 have continued to go from strength to strength. Aminah did brilliantly on All Aboard, pushing herself to the very top with the rest of her group. Quietly and without fuss, Alice and Willem have completed every single challenge presented to them; they are stoic members of the team and there would be something lacking were they not part of it. The day ended with the disco and it’s here that Leah has to be mentioned: she is one of the most accomplished dancers that the PGL disco has ever seen. Miss Rimington and the lovely Group 5 tackled All Aboard first thing. Daniel and Matty reached the top swiftly, the best of a very good bunch. They all moved on to Sensory Trail, avoiding numerous obstacles, some natural, many man-made. Vertical Challenge was next, an upright obstacle course consisting of a rope ladder, tyres, a climbing walk and a net. Molly and Winnie took their time, ignoring their discomfort by making great progress, to the delight of the rest of the group. Group 6 had a similar day to Group 5, only in reverse. Sensory Trail provided many laughs, particularly when Holly was leading them all round, despite complaining of bugs which were actually twigs, strategically placed by the instructor. On All Aboard, the whole group made pleasing progress. Fencing saw William display competitive instincts and great agility, whilst the Vertical Challenge was negotiated fabulously by Louis and Harveen. Group 7 and Miss Ash, on her last day, began with Vertical Challenge and Sensory Trail. The whole group achieved their targets and could lunch with satisfaction at their efforts. 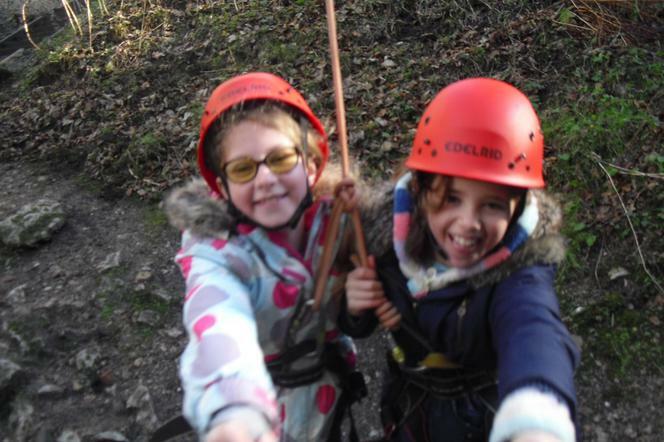 On All Aboard, Sophia and Milly stood out, with teamwork and confidence assisting their way right to the top. They finished the day with Fencing in the warmth. There was a general air of disbelief that we awoke to our final full day already, but we headed to breakfast with a determination to make the most of it. The weather was dull, though warmer, as it was to remain all day. Group 1, now accompanied by the recently arrived Mrs Cresswell, headed to the Trapeze, a pole with a tiny platform from which the challenge was to jump off and grab the eponymous bar. Priya’s agility enabled her to zoom up like a squirrel, almost before anyone noticed. Orienteering followed, during which Mrs C’s small group managed to get lost. The afternoon began with the Challenge Course, before Ed truly impressed on Jacob’s Ladder, initially claiming he couldn’t go further before doing just that. 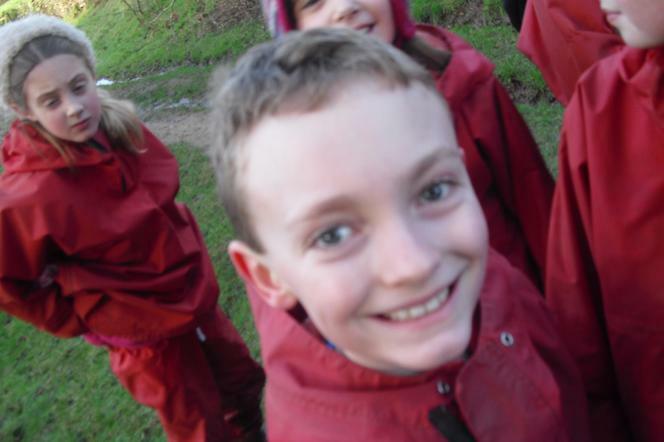 Mrs Green’s Group 2 began with Orienteering, which was one of Max’s favourites of the week. 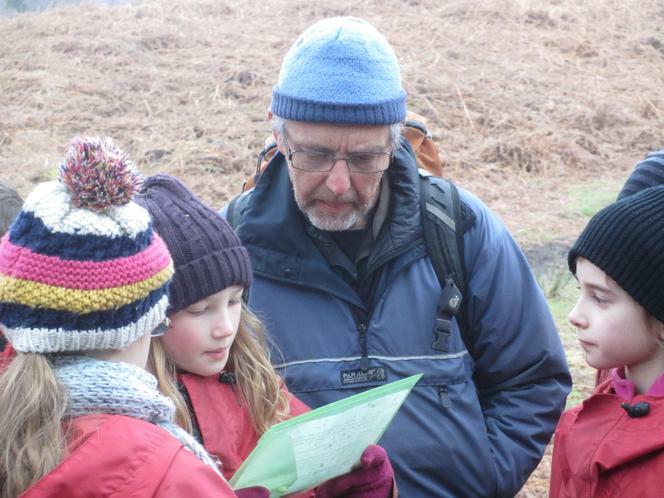 As ever, he was keen to show the way with his map-reading skills, epitomising his week overall. The trapeze followed, Luke not enjoying the experience for some time until a ‘Repeat After Me’ song persuaded him to finish the challenge proudly. Kai’s performance also impressed, though he found it rather amusing that his hands missed the bar, but his mouth didn’t! Mrs Green was full of praise for the group in Jacob’s Ladder and Challenge Course in the afternoon, just as she has been all week long. Mr Dudgeon was Group 3’s new partner, as they headed to the Challenge Course. Excellent teamwork was on display. This was followed by orienteering, using map skills to the full alongside less familiar members of the group. The Trapeze awaited after lunch, with Olivia confidently volunteering to go first, meeting the challenge head on. Ollie then reached the top without the adults even noticing. Finally, Jacob’s Ladder – a swinging set of logs at increasing distances apart- saw Hannah A working fabulously in her team, encouraging and physically assisting them to reach number 8. A more relaxed morning waited for Group 4 after breakfast. The day began with orienteering where all of the children worked well together. 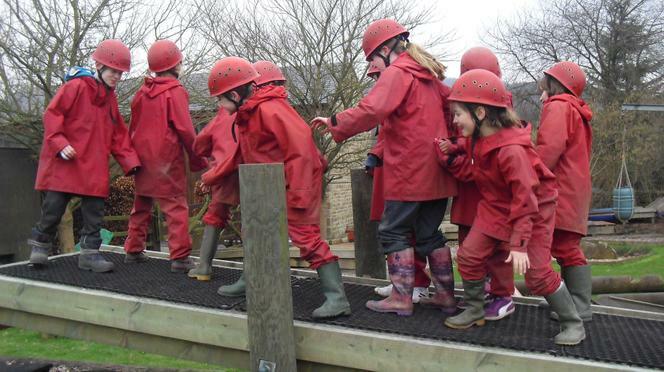 The Challenge Course was next and the children had excellent fun crawling through the mud and throwing themselves over walls. The real challenge arrived after lunch with Jacobs Ladder. Ben did particularly well here, despite a slight knee injury, to haul himself and his team to the seventh rung. Harry shone as well, the instructor stating that she “had seen many people climb, but he is the best”; it was quite an impressive sight. Trapeze completed the day’s tasks and Rosie and Rudi were impressive. They climbed and leapt off the pole twice, but more remarkable was the speed at which they did it. Group 5 had the Trapeze. Rebecca reached the top and swung with beaming pride. Willem and Felicity, alongside others, reached the very top of Jacob’s Ladder. Miss Rimington has truly loved every second with her group, who continued to impress during Challenge Course and Orienteering during the afternoon. Group 6 enjoyed/ endured a rather High-Impact morning. Jacob’s Ladder was first in line, a rather difficult start, yet the group proved more than its match. The trapeze also provided some moments of sheer panic. Not from Charley and Luca, however, who stood tall on the wobbly platform, before taking the Leap of Faith. The Orienteering and Challenge Course were enjoyable afternoon activities, with teamwork to the fore. Mr Unsworth joined Group 7 and they began with the Challenge Course, an opportunity to work hard individually and collectively. They then moved on to Jacob’s Ladder, on which Hope and Madison excelled, after initial doubts. Following lunch, the group’s ability allowed for them to have two goes on the Trapeze, unheard of by the instructor. Josh lead them off and took less than two minutes, before Lucian made the group proud of him as a result of his willingness to be unaffected by his obvious nerves. The final evening meal was consumed with gusto. We then began to pack before a large-scale game of Hide and Seek, rather grandiosely titled Ambush. Group 1 (of two) won convincingly, whilst teachers relished the relatively quiet nature of the activity. A very early morning awaits. See you all tomorrow, literally.